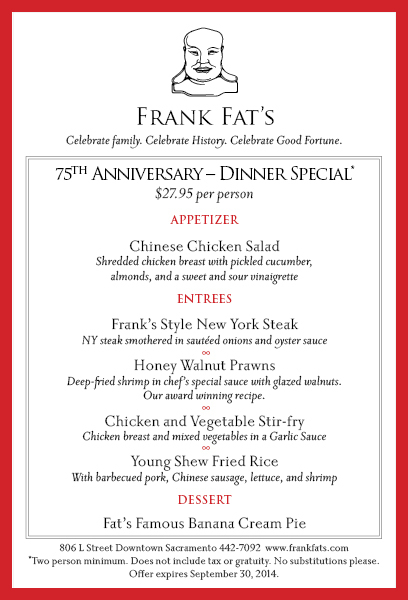 Frank Fat’s Celebrates 75 Years with a Special Pre-Fixe Menu until October 31st! Last night, Andy and I were treated to a sampling of Frank Fat’s very best dishes in promotion of their 75th Anniversary Dinner Special. We met Head Chef Mike Lim and he spoke with us before our meal, not only about the food on the 75th Anniversary menu (below), but some other dishes available at Fat’s (a seasonal King Salmon dish and Farm to Fork People’s Choice Award recipient called Forbidden Salmon) and a Peach and Chicken Salad. 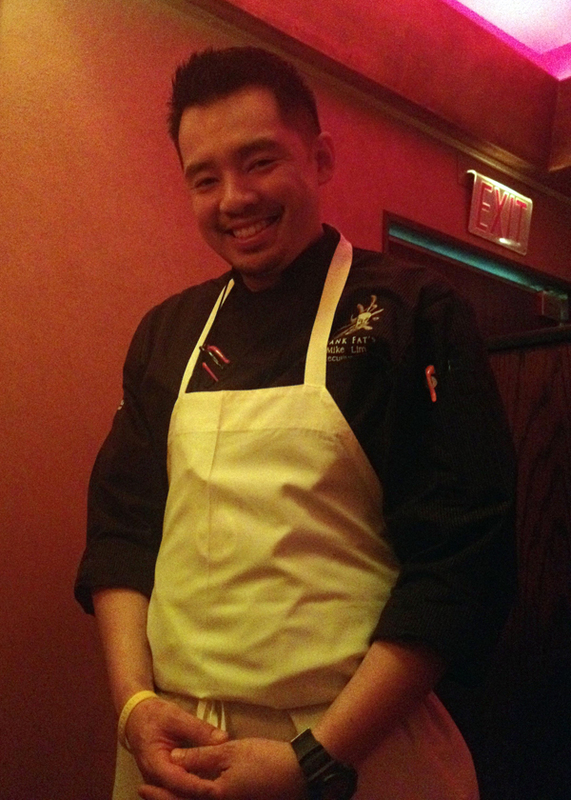 Chef Lim will also be contributing a dish at this Sunday’s Farm-to-Fork’s Tower Bridge fundraising dinner. Before I dive into the food we had, I will discuss the wine. I was distracted by making sure we had reported in with social media via Swarm, Twitter, Facebook, etc., Andy chose a 2012 Chateau Ste. 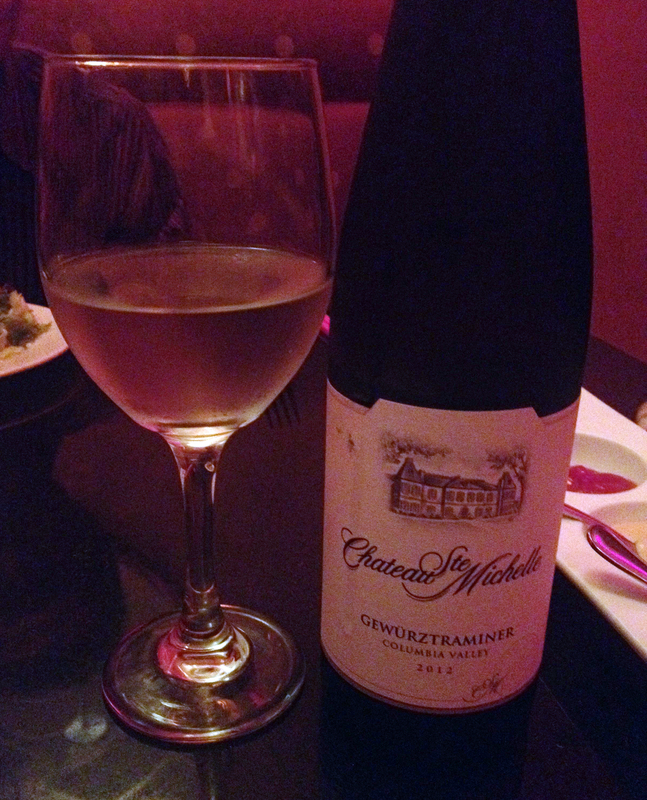 Michelle Gewürztraminer. He did this because a slightly sweeter (but not too sweet) wine was going to pair very well with almost all of the food we were going to try (a lot of sweet and sour ingredients). He figured this wine would strike the most balance and it did. So instead of having to choose one main course each (as one would do if ordering from the pre-fixe menu, Chef Mike food bombed us with ALL of the dishes on the menu. Um, OK, twist my arm. (Everything you will see in this editorial except for the Yu Kwoks, Peach Chicken Salad, and Forbidden Salmon were inclusive on the pre-fixe.) 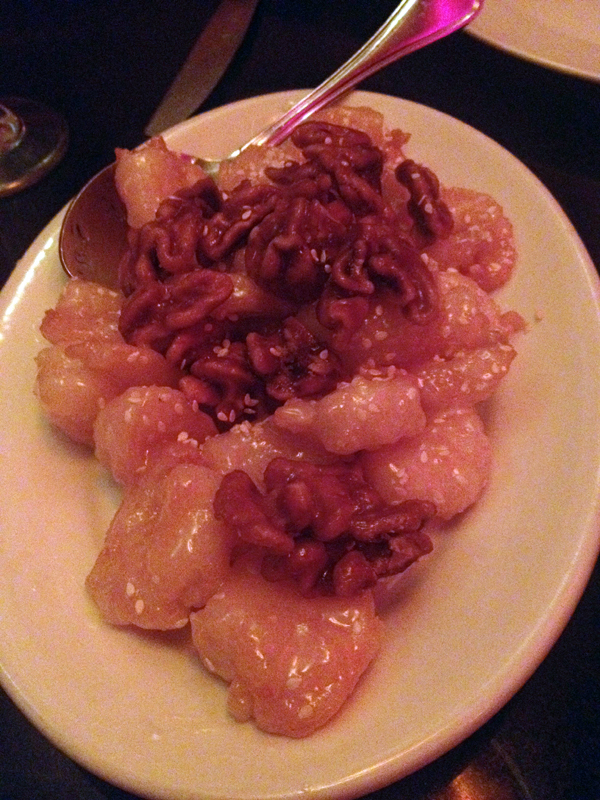 Next up was the Honey Walnut Prawns: Lightly fried prawns glazed with honey sauce, walnuts, sesame seeds. This dish is probably one of the most iconic at Fat’s, so no wonder it’s on the 75th Anniversary menu. It’s sweet, crunchy, and tangy. Again, a great pairing with the Gewürztraminer. 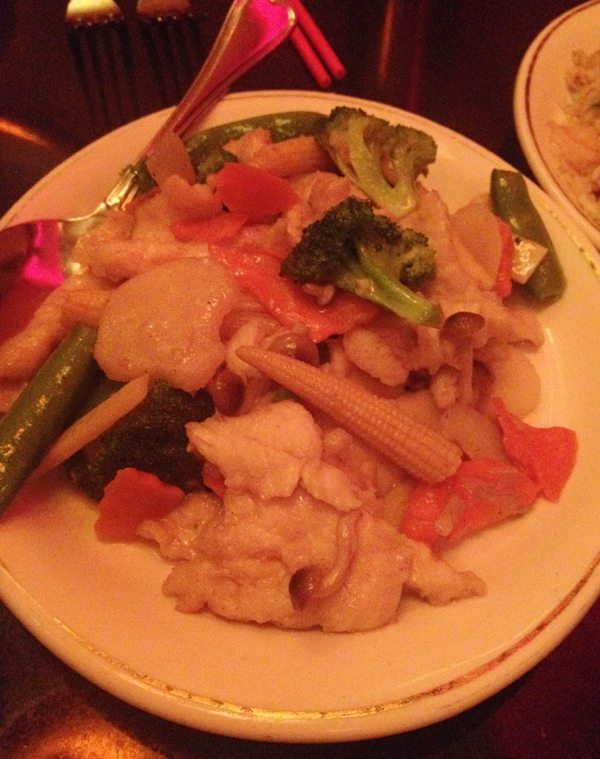 Then came the Chicken and Vegetable Stir Fry: Chicken breast and mixed vegetables in a Garlic Sauce–the one thing I didn’t feel guilty about eating! 🙂 I love stir fry dishes because of their high protein and vegetables as carb ratio. But of course, tonight would be different and I would have real carbs, as we also sampled the fried rice on the pre-fixe menu. 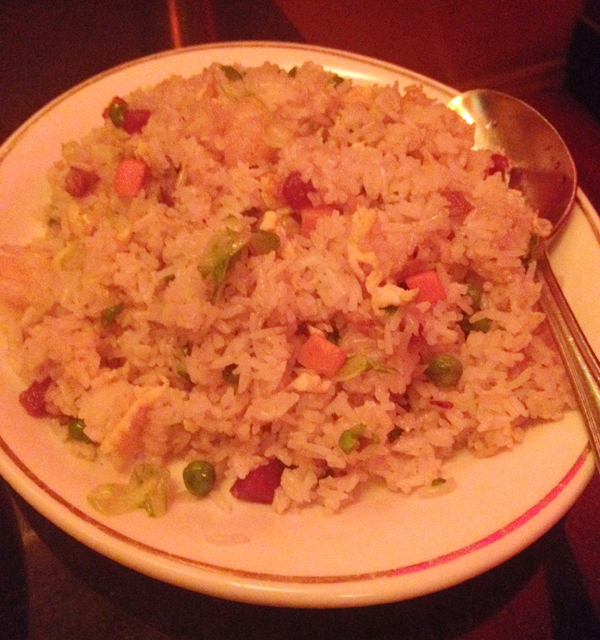 Next the Fried Rice dish: Young Shew Fried Rice: With barbecued pork, Chinese sausage, lettuce, and shrimp. It was nutty in flavor and had hints of sesame oil. The pork in the rice had been rendered so it was slightly crispy. The shrimp were small but plump and the little peas were bright green and fresh––they burst like little caviar when chewed. At that point in the meal, I knew it would be extremely easy to write about. I sat there and realized how much I was enjoying the food because I hardly ever eat foods like fried rice or shrimp with carmelized walnuts. And hardly ever eating them makes them taste so much better when you do treat yourself! 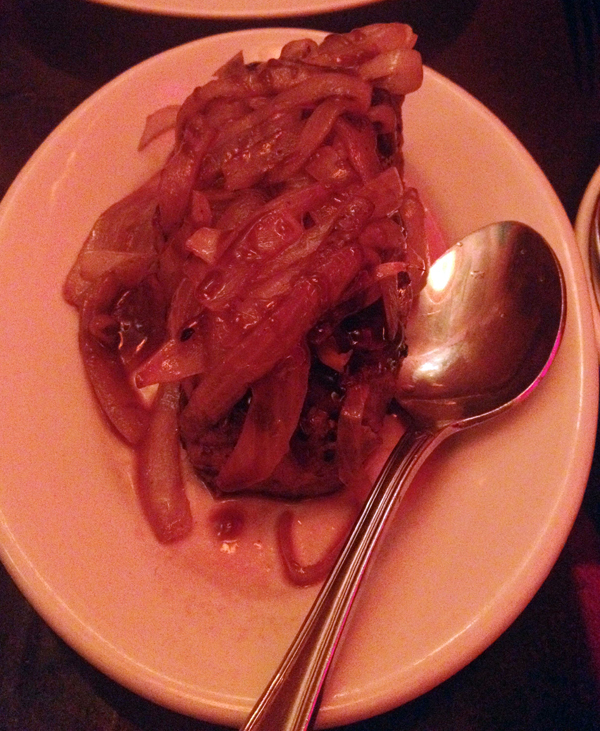 Then, the eagerly awaited (and another signature menu item at Fat’s): Frank’s Style New York Steak: A 5-ounce NY steak smothered in sauteed onions and oyster sauce. We ordered it rare, as you really should. You can’t see in the picture, but it really did come out rare. It was tender and juicy and piled high with onions and the sweet oyster sauce. This also arguably went with the Gewürztraminer. 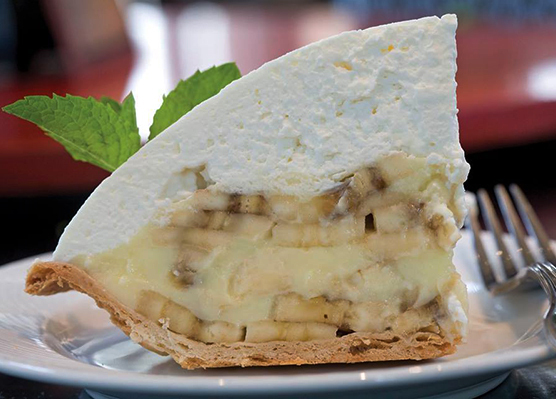 The 75th Anniversary menu ends in Banana Creme Pie, the ever popular classic dessert at Frank Fat’s. 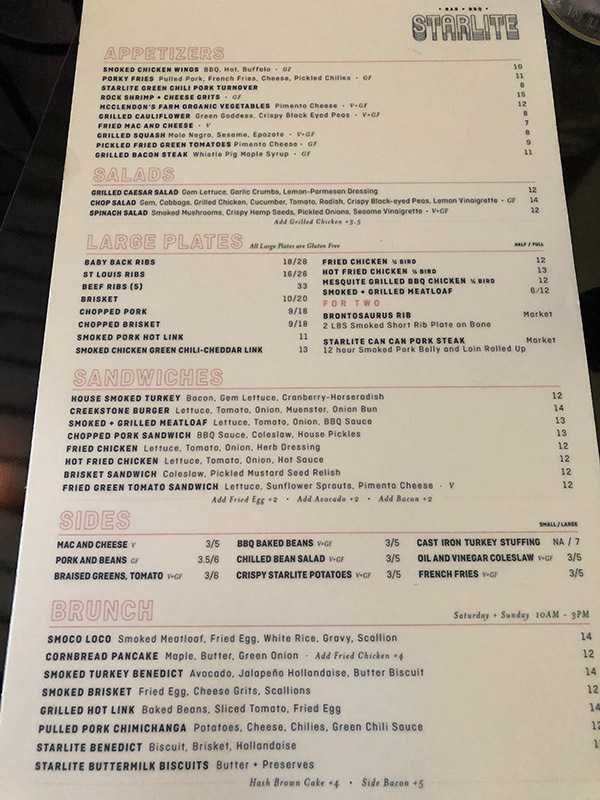 At $27.95 per person, it’s a real bargain and a nice sampling of the food that made Frank Fat’s the empire it is today. 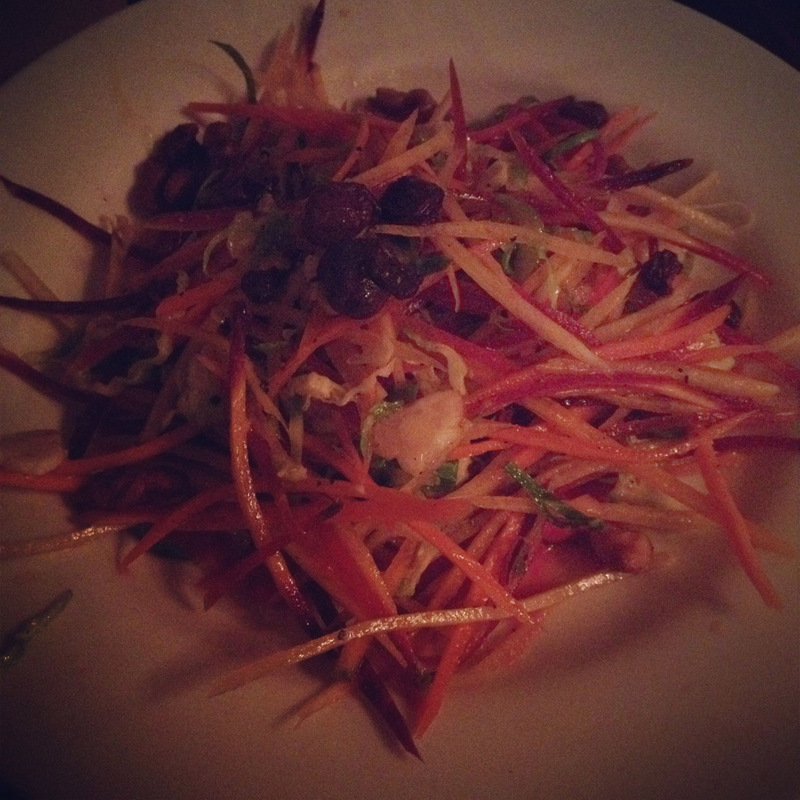 We were also able to try the Peach and Chicken Salad with honey walnuts and what? Feta cheese. 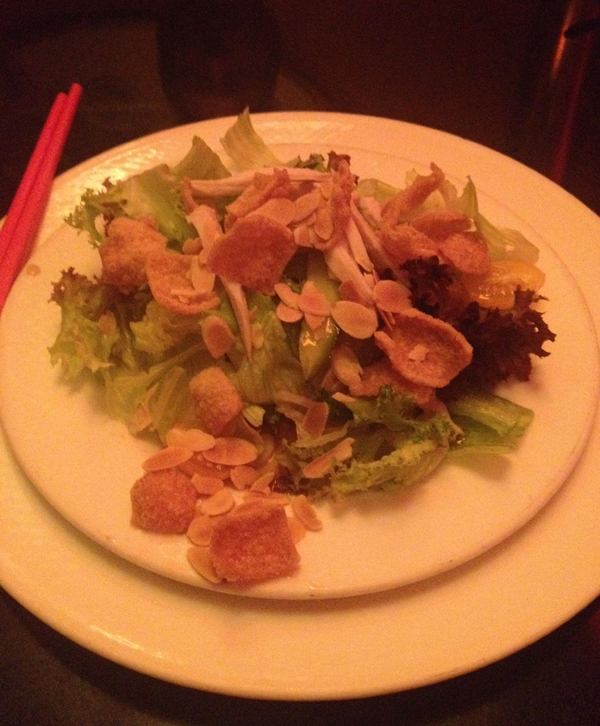 Super seasonal and very Farm-to-Fork–and off the wall, as I have never seen Feta cheese in a Chinese restaurant. Loved it! My favorite dish of the evening was the “Forbidden King Salmon”: Salmon a la Plancha (grilled on a metal plate) and served with with Black Forbidden Rice, Heirloom Tomato and Lemongrass Veloute, Cilantro. It was with this plate I could truly see what Chef Mike is trying to do (and succeeding in doing) at Fat’s. He is using traditional Chinese techniques to make farm-to-fork cuisine. 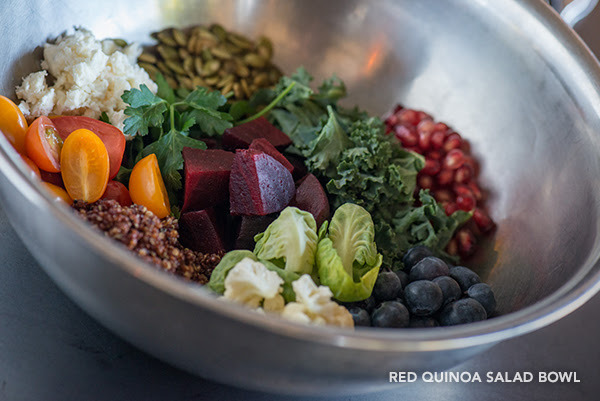 It’s not really a fusion thing, it’s more of using the methods already in place to elevate our bounty of seasonal ingredients. 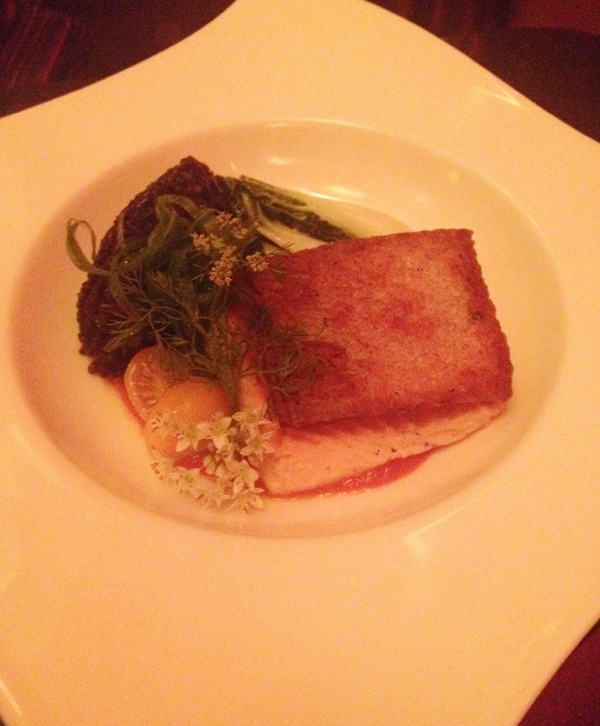 The salmon dish was also a great example of incorporating different textures. The fish was perfectly cooked and flakey on top, the forbidden rice was almost a little sticky, but not as sticky as sushi rice, and there was a tomato and lemongrass veloute sauce on the bottom that brought the whole plate together. It was all makings for a course I will not soon forget. Sadly, it won’t be available much longer, as salmon season is fleeting. 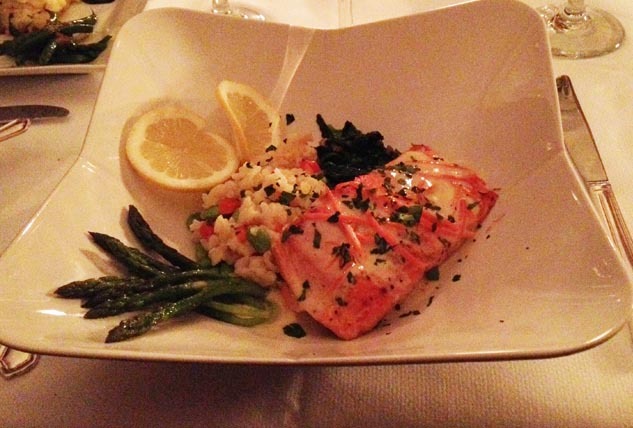 So do yourself a favor and stop in for lunch to try the Forbidden Salmon. Take a half day off if you have to. It’s really that special. Thanks to Frank Fat’s restaurant for hosting us, Chef Mike for stopping in the middle of a slightly busy dinner service to talk to us about the food, and thanks to Rosie, our server, who took very good care of us. Though the 75th Anniversary Menu promotion ends October 31st and from Oct. 1 to Oct. 15, Fat’s will be hiding a $75 gift card in different locations around Sacramento that are noteworthy to the Fat family’s history. Clues for the “15 days of Fat’s” promotion will be posted on the Frank Fat’s Facebook, Twitter and Instagram accounts as well as on the frankfats75.com website. 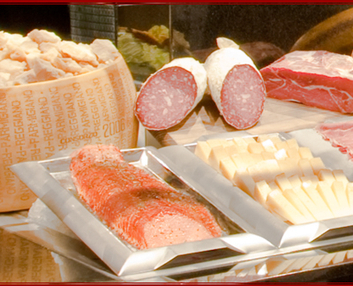 The special anniversary pre-fixe menu only lasts until October 31st, so make those reservations ASAP! 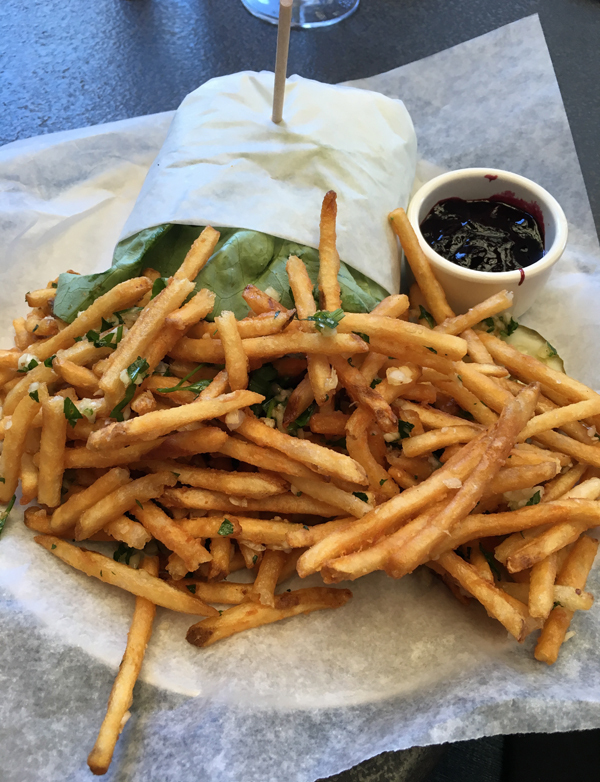 You can find Frank Fat’s on Facebook here and follow Fat’s Restaurants on twitter here. 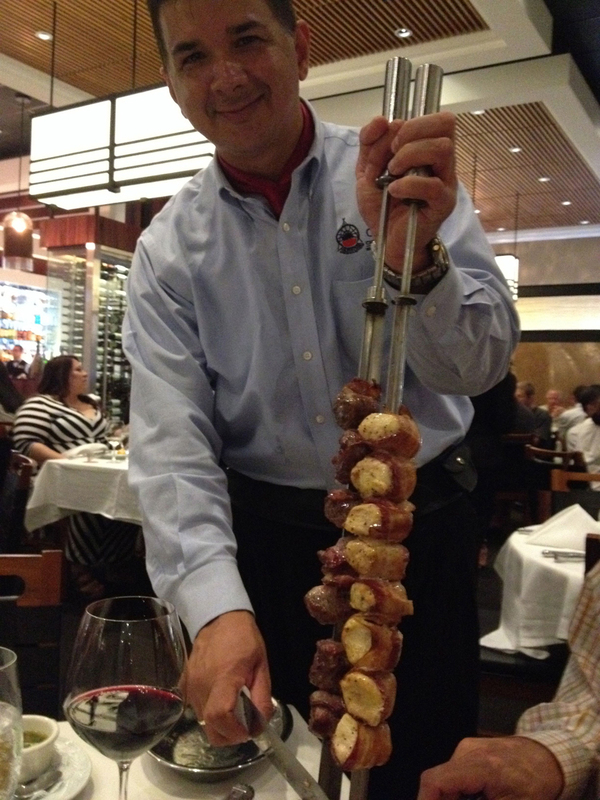 Fogo de Chão in San Jose: A Meat Lover’s Paradise! 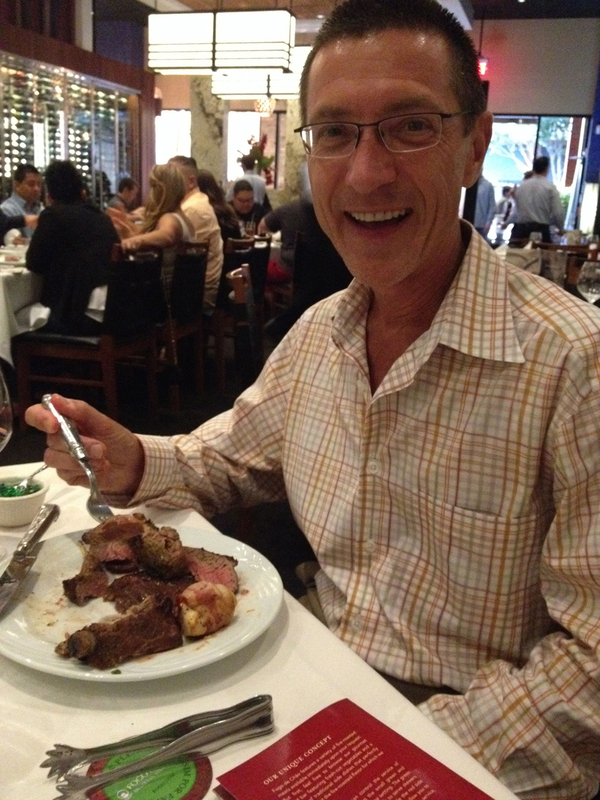 If you have never dined at a Brazilian steakhouse before, there is a procedure to the meal, and it’s really quite fun. After being seated, diners are given a cardboard token (looks like a drink coaster) that is green on one side and red on the other. This token is used to signal the gaucho chefs to begin meat service to your table. 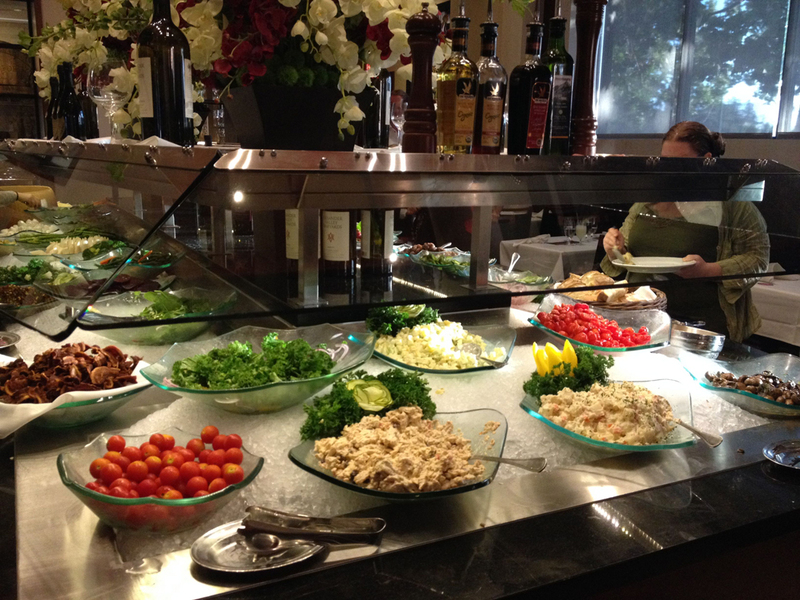 But first, it’s off to the salad bar! The salad bar features premium items such as 24 Month, Aged Parmesan, Aged Manchego Cheese, Prosciutto, Brazilian Hearts of Palm, Artichoke Bottoms, Sun-Dried Tomatoes, Fresh Mozzarella, Smoked Salmon, Italian Salami, Jumbo Asparagus, Tabbouleh and Shitake Mushrooms, not to mention at least large bowls full of different lettuce mixes to use for the base of your salad. 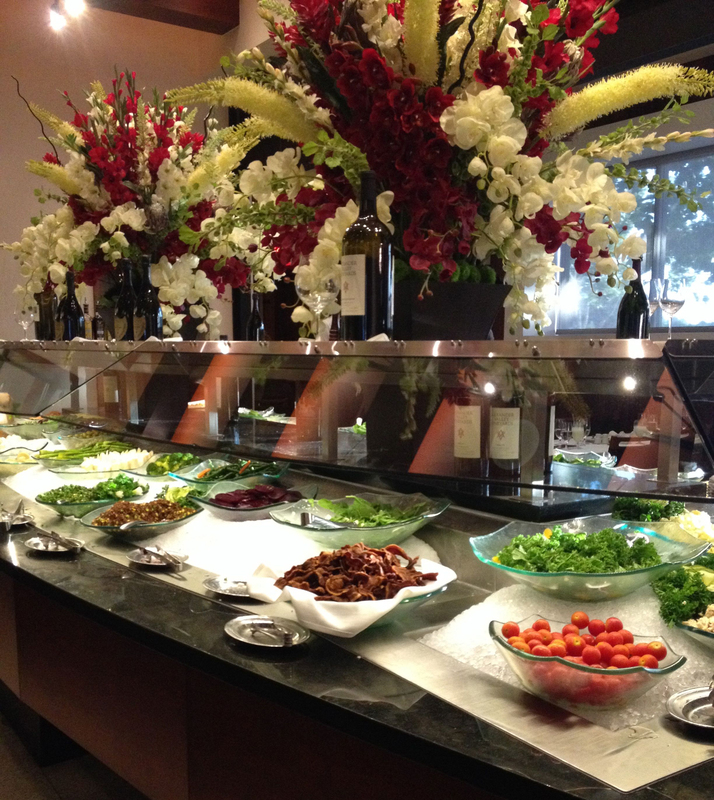 It would be easy to get full on just the salad bar alone, so pace yourself. When you are ready for the meats to be served, turn your token green side up, signaling that you are ready for our gaucho chefs to begin tableside service. This continuous service is known as “Rodizio” style. When you are full, you flip the token to the red side until you are ready for more offerings. 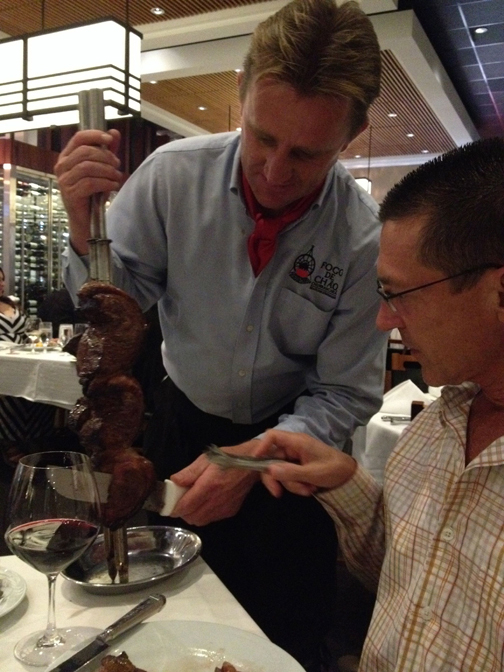 In the photo above, Andy is being served the signature steak of the restaurant, the Picanha (pea-CAN-ya), a prime cut of top sirloin. 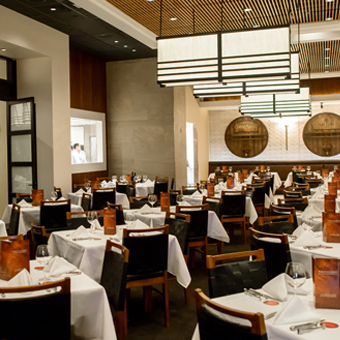 Fogo de Chão is a recipient of the prestigious Wine Spectator Magazine Award of Excellence for eight consecutive years. 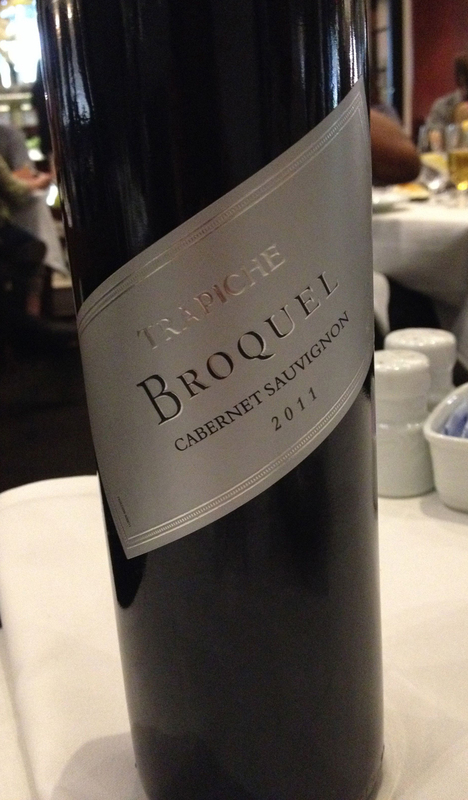 I chose a reasonably priced Cabernet made by Trapiche (a label I had at least heard of before). It was quite good. 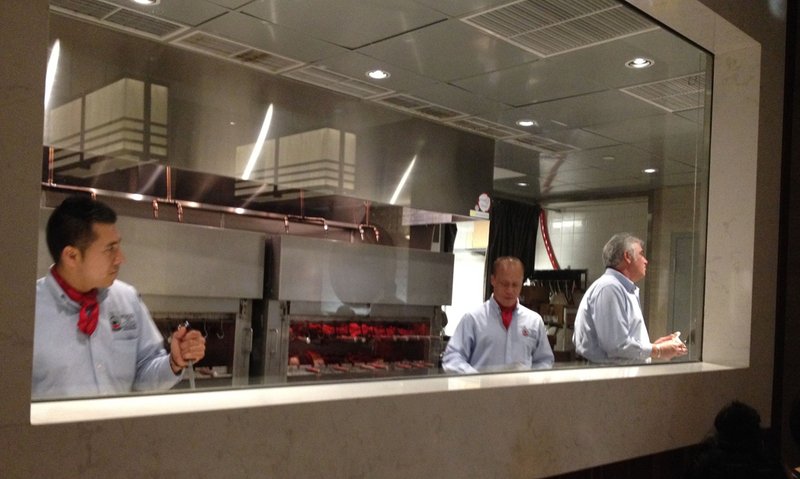 Below, the gaucho chef serves Andy a bacon wrapped filet mignon, and a bacon wrapped chicken. 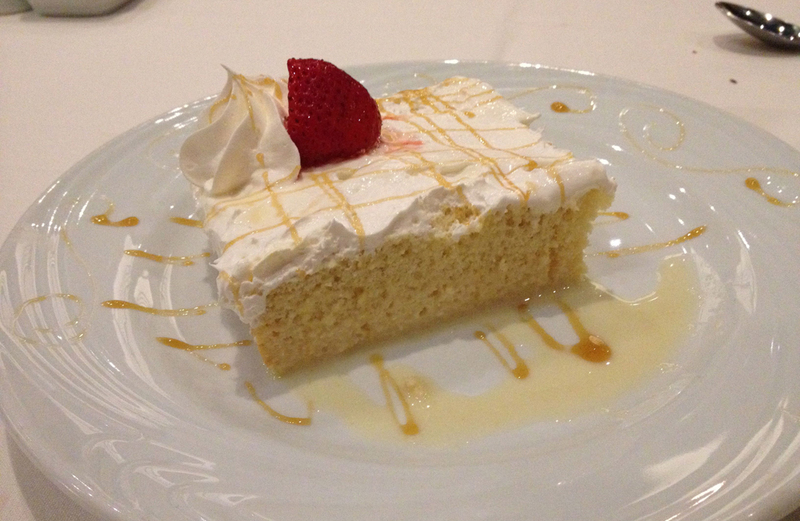 Lunch at Fogo de Chão San Jose is $34.50 | (Salad Bar Only – $24.50) and is served Mon-Fri 11:30-2:00. 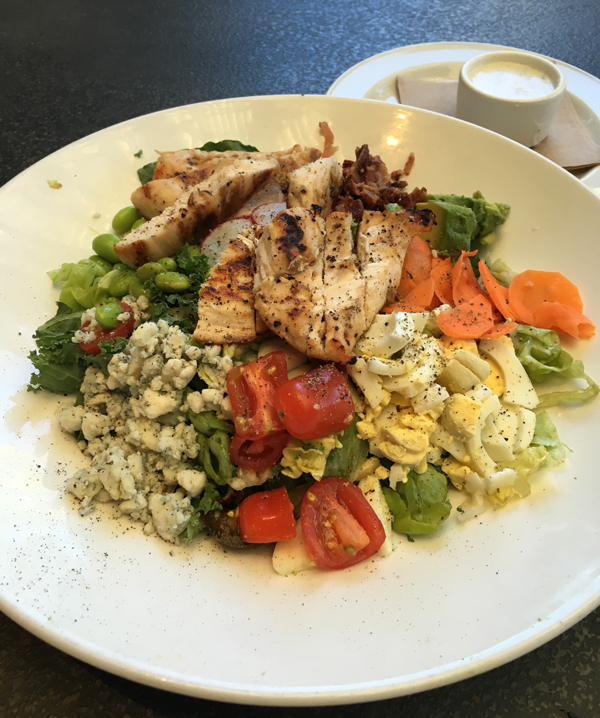 Dinner is $54.50 | (Salad Bar Only – $29.50) and is served Mon-Thur 5:00-10:00, Fri 5:00-10:30, Sat 3:00-10:30, and Sun 12:00-9:00. 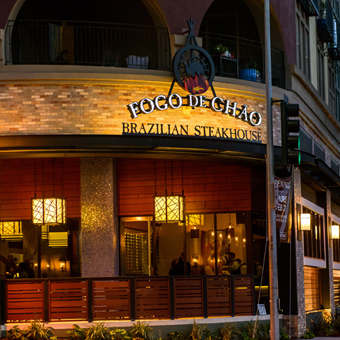 You can like Fogo de Chão on Facebook here, and follow them on twitter here. Faisal Nimri and Bashar Sneeh own what is currently the most popular restaurant in downtown Carmel: Dametra Café. 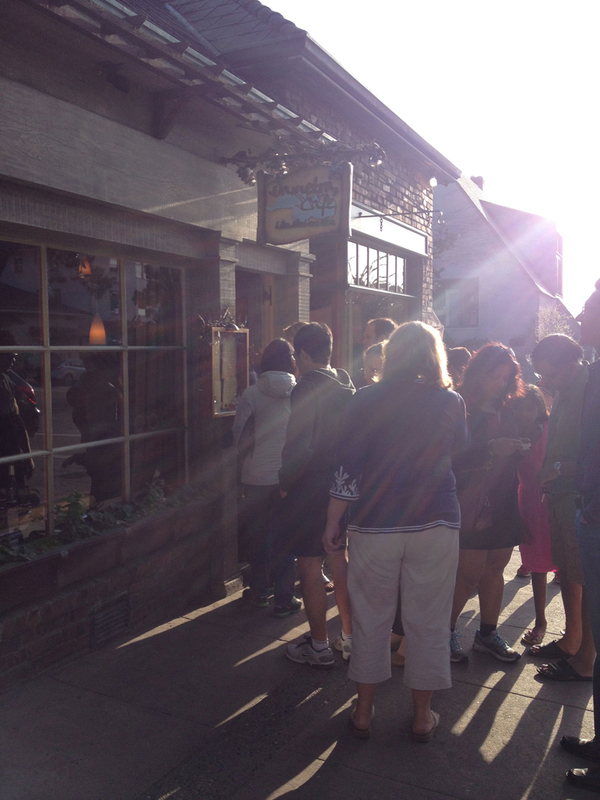 Since mid-2009, the restaurant has been booked solid (see above photo of line outside the door) for dinner every night, and after our meal there during our second night in Carmel, I can see why. 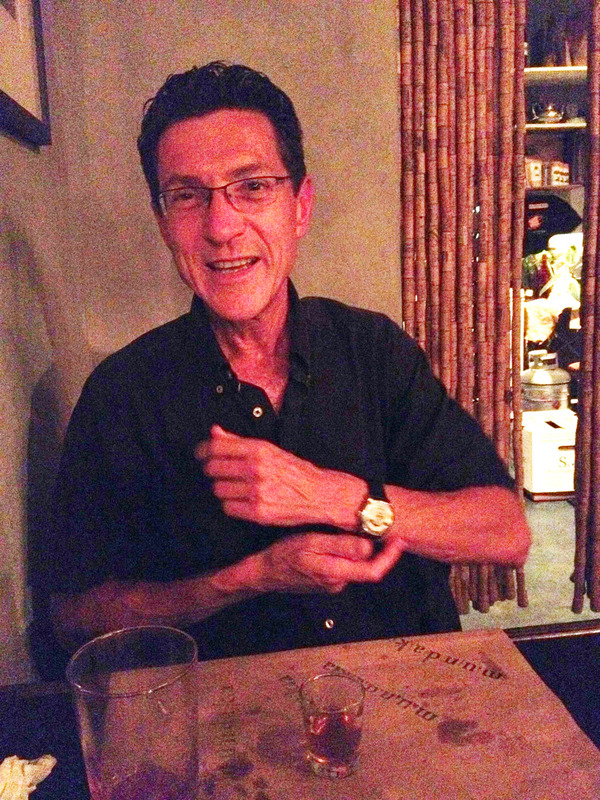 When Andy and I walked into restaurant, we were greeted by Faisal and seated promptly. I thought that perhaps we were being given special treatment (as I had arranged our dinner with the Carmel Chamber of Commerce as part of our trip). But as I watched from our table, I saw him treating all the incoming customers this way––like welcoming a family member into his home. The name Dametra Café (which opened in 2008) is a combination of their homelands: Damascus plus Petra (the ancient Jordanian city near the Dead Sea carved of rose-colored stone. 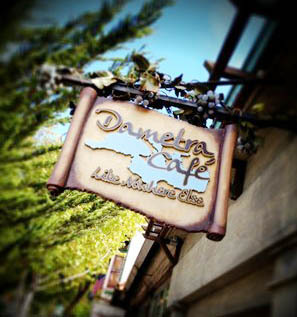 By 2010, the Carmel Chamber of Commerce named Dametra Café Business of the Year. The Café’s menu is a delightful amalgamation of Mediterranean foods Nimri (from Jordan) and Sneeh (from Syria) loved during their childhood: spanikopita from Greece, calamari from Italy, smoked salmon from France and hummus from Lebanon. Why did I want to eat here? I certainly did not know the 14 table restaurant was so popular until we arrived. Andy and I actually found Dametra Café passing by the restaurant on foot while wine tasting during our last visit to Carmel a year ago. I remember someone standing outside and beckoning us to come in for dinner (again, very hospitable). 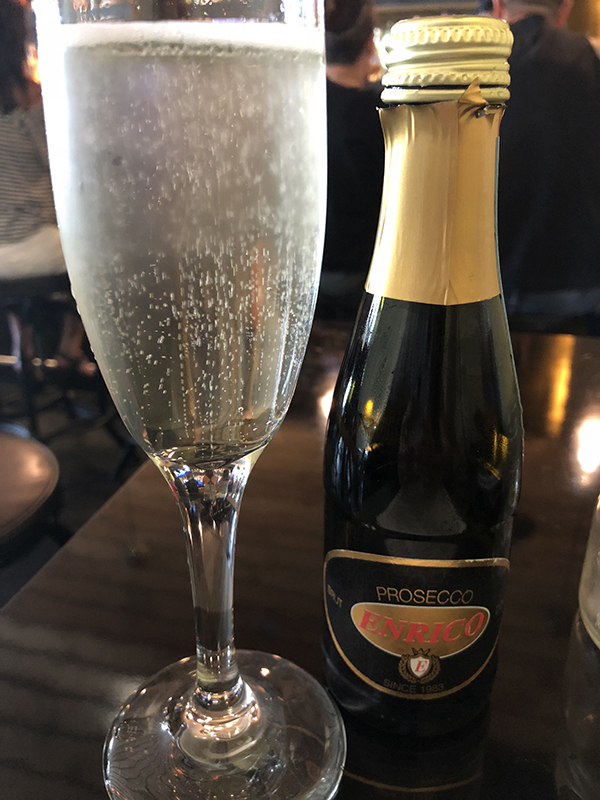 We had already made plans for the evening (Fandango in Pacific Grove), but vowed to return to the Café on our next visit to Carmel. We finally made it! Then it was on to the meal! 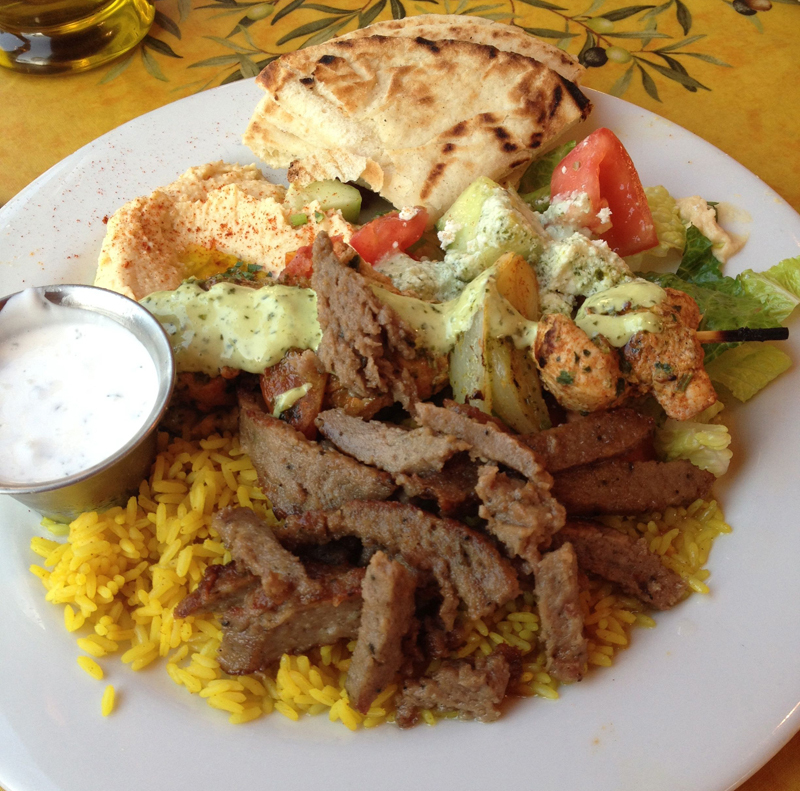 Since we had indulged earlier in our hotel’s happy hour, we stuck to wine by the glass instead of choosing a bottle of wine with dinner.I picked the Greek Combination Platter: Gyros, chicken kabab, humus, yogurt sauce, pita bread, rice and Greek salad. This is the quintessential plate to order if you have never eaten Greek food and want to sample what it’s truly supposed to taste like. 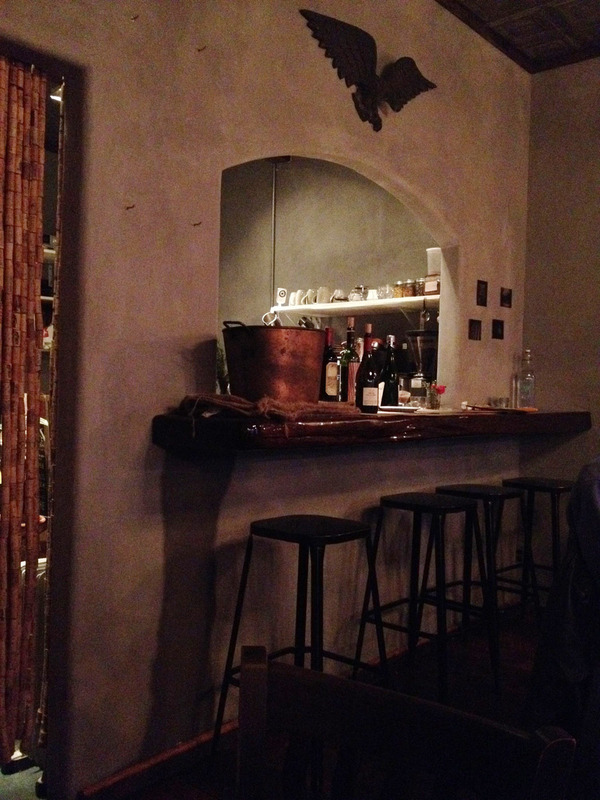 I was in heaven, and ordered a glass of Tapena Tempranillo (Spain) to enjoy with it. 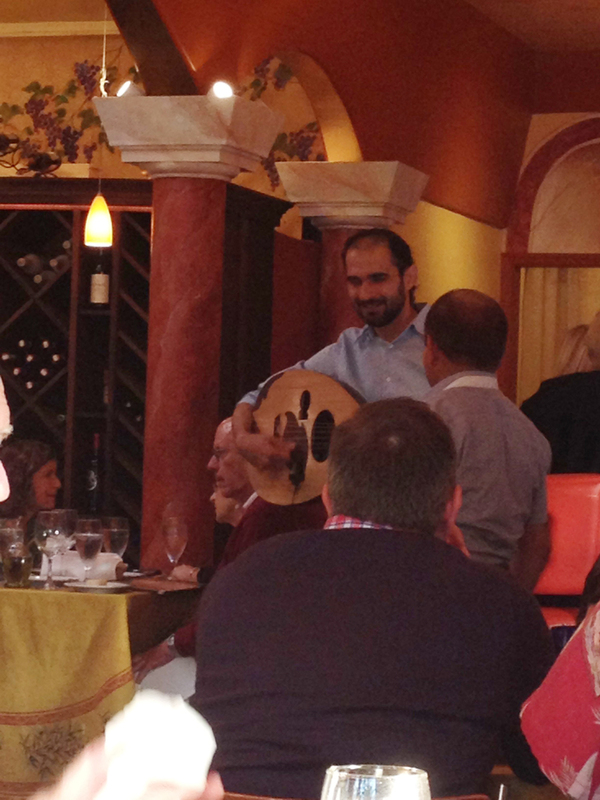 During the meal, one of the servers serenaded us and the other guests in the restaurant, accompanied by Faisal, strumming a six-stringed Greek oud. 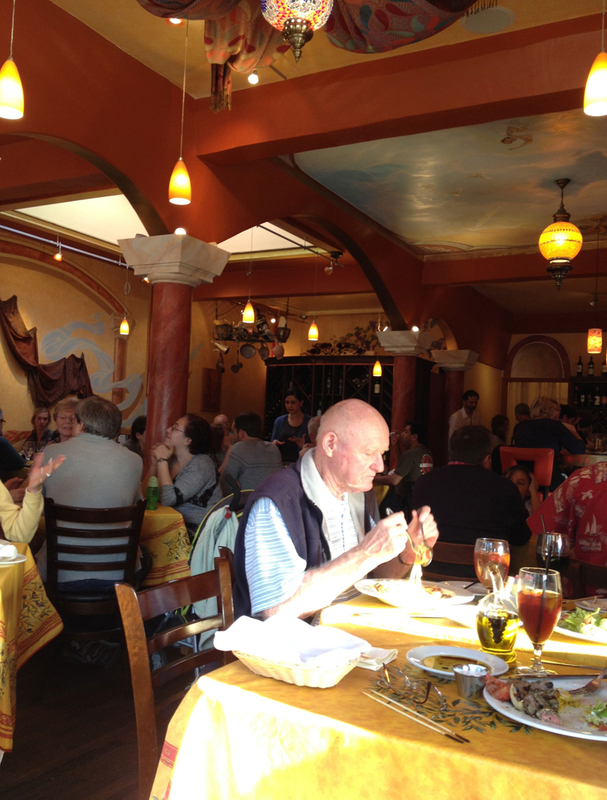 Dametra Café is located at the SE corner of Ocean & Lincoln, Carmel by the Sea, CA93921. They are open daily 11 a.m. – 11 p.m., except Christmas Day. 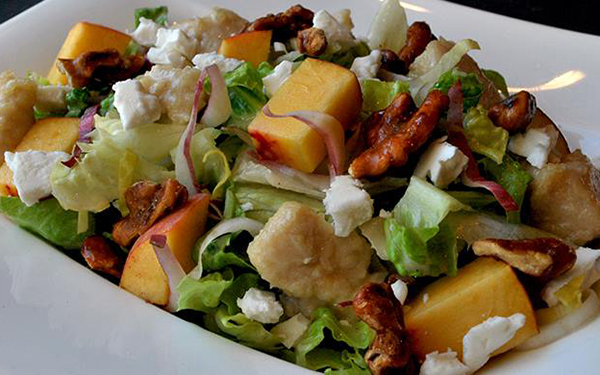 You can reach at Dametra Café at (831) 622-7766 and find them online here. 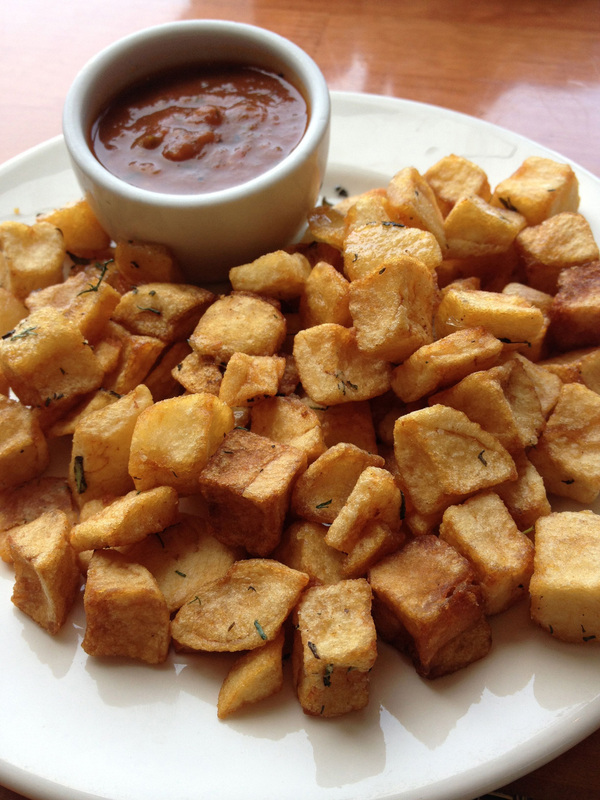 There are a ton of great reviews for Dametra Café over on Yelp! 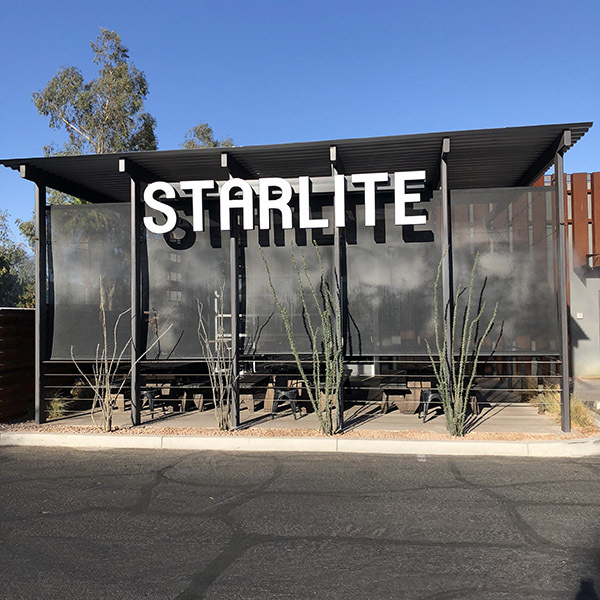 Also, check out the video below featuring Dametra Cafe to really see inside the restaurant and how wonderful it truly is. 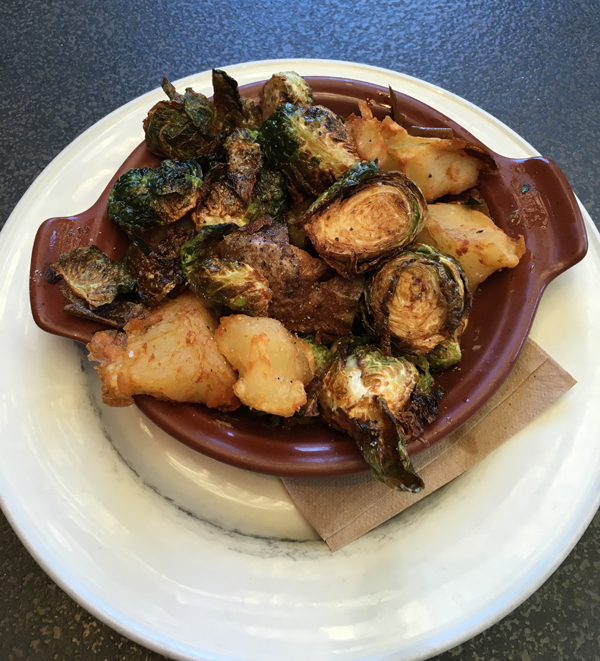 It was less than a year ago when we last visited Mundaka, a small plates restaurant nestled in the heart of downtown Carmel. 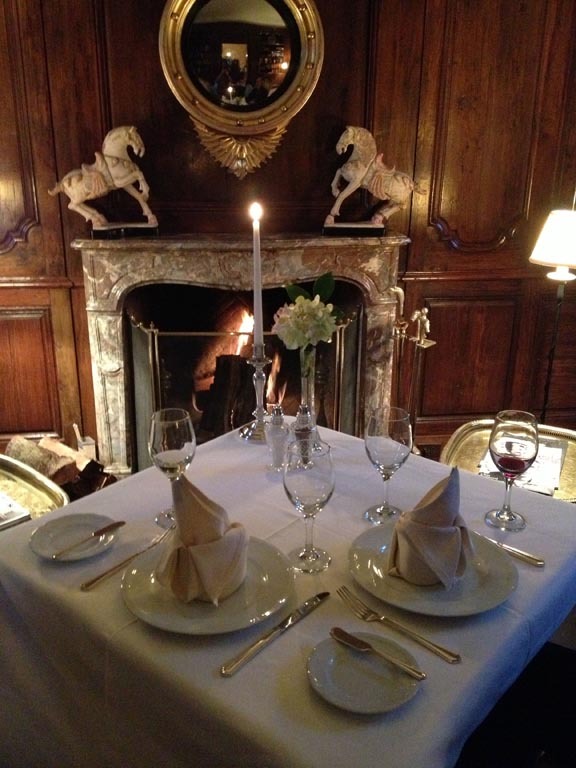 Since then, the restaurant has continued to thrive and recently celebrated its 5th anniversary! 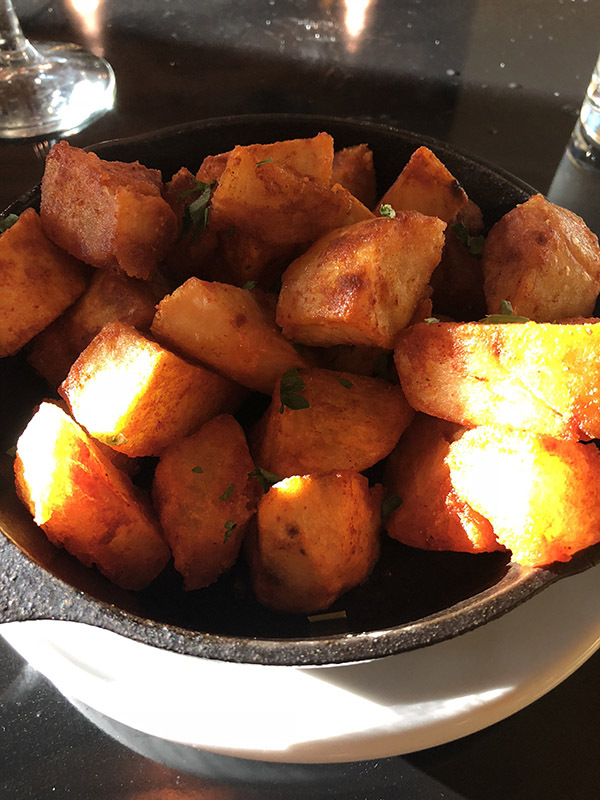 During our recent stay at The Vendange Carmel Inn and Suites Andy and I were honored to be invited back to Mundaka for dinner to try some new items on the menu, as well as some of our favorites from last time. 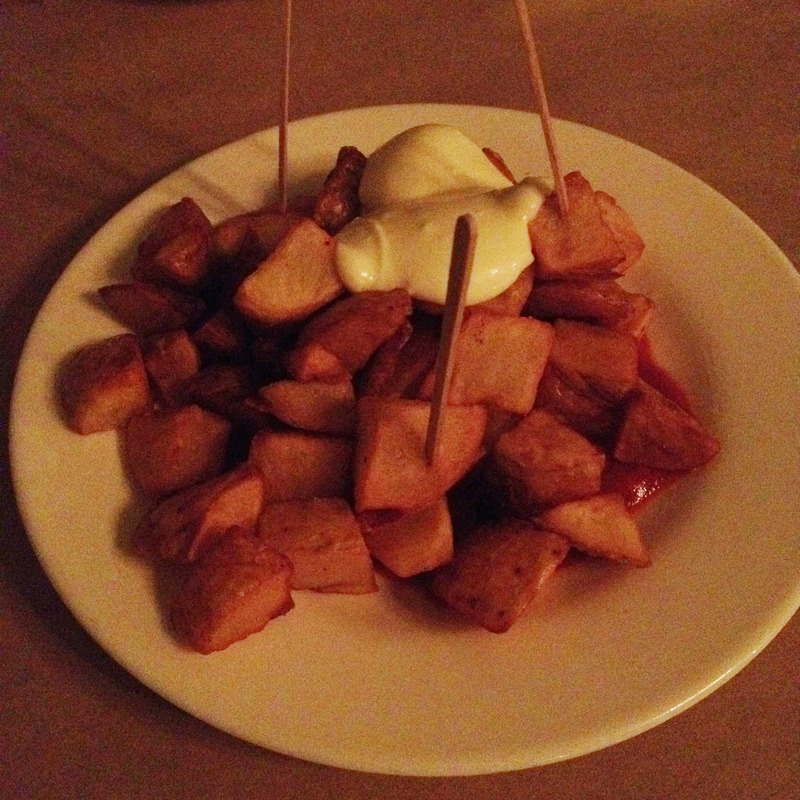 We began the meal by ordering the Bravas: Fried potatoes, brava sauce, aioli. It happens to be one of the most classic tapas in Spain, and a must try at Mundaka. 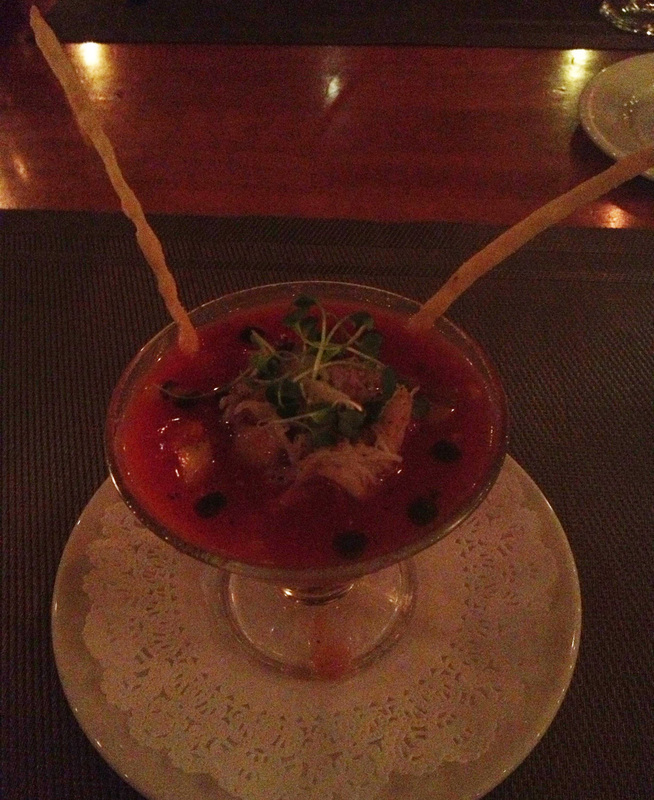 Of course the Bravas were excellent, but I think the Crudo was the first new thing on the menu that caught my eye. When the plate came out, I was surprised to see such a beautiful presentation of multi-colored julienned vegetables: Carrots, Brussels sprouts, beet purée, candied walnuts. The juxtaposition to the Crudo dish was the Charcuteria! Time to get our fat on! 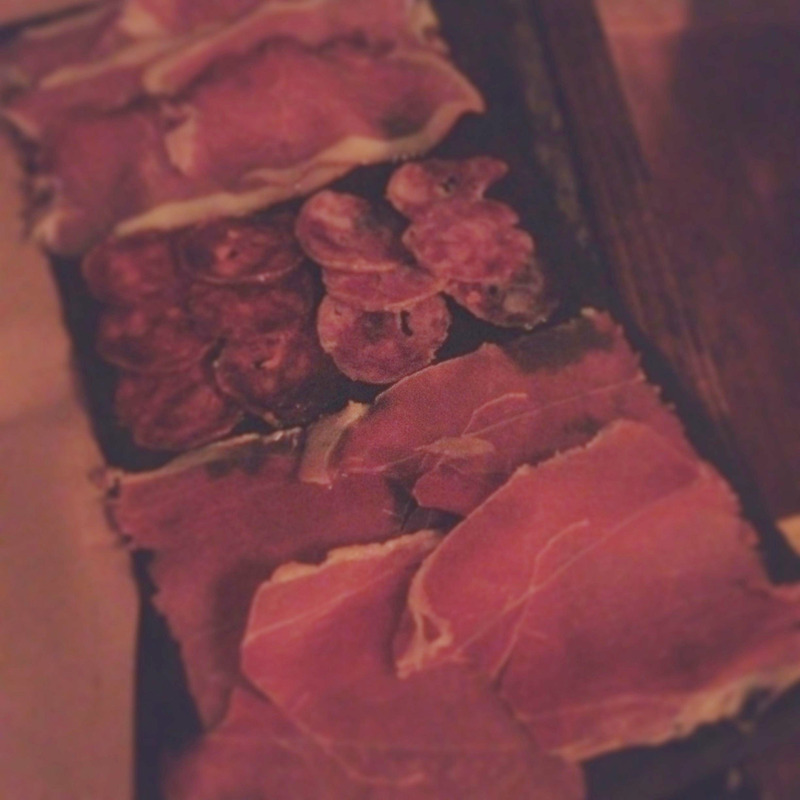 The plate was composed of Serrano ham, Iberico sausages, house cured lomo. Slice upon slice of meaty goodness. And there was more to come! I guess you could say our main event was the Carne: Hanger steak, truffle fries, free foie butter. 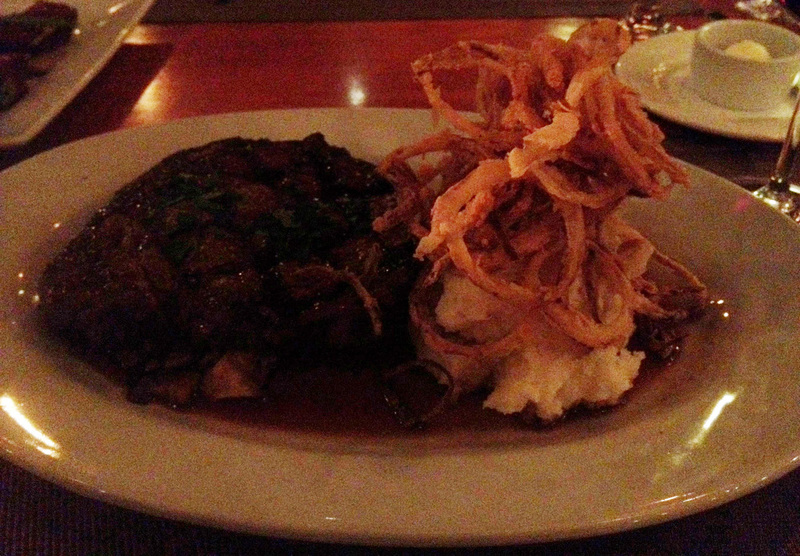 The hangar steak was tender and flavorful, and cooked a perfect medium-rare. 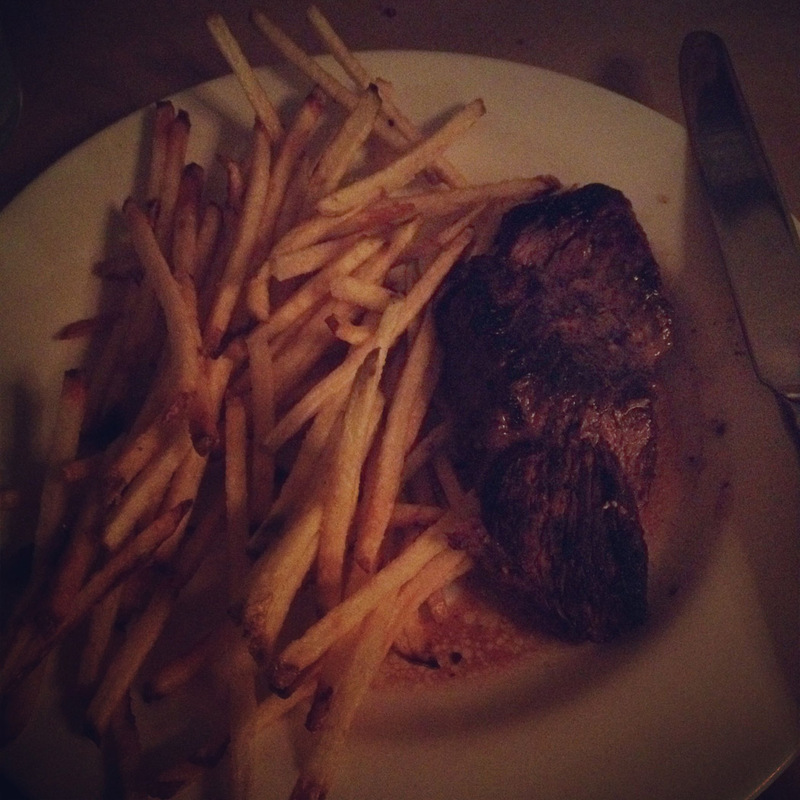 The fries were the very skinny variety–like matchsticks, if you will–they soaked up the foie butter that had melted onto the plate from the steak. 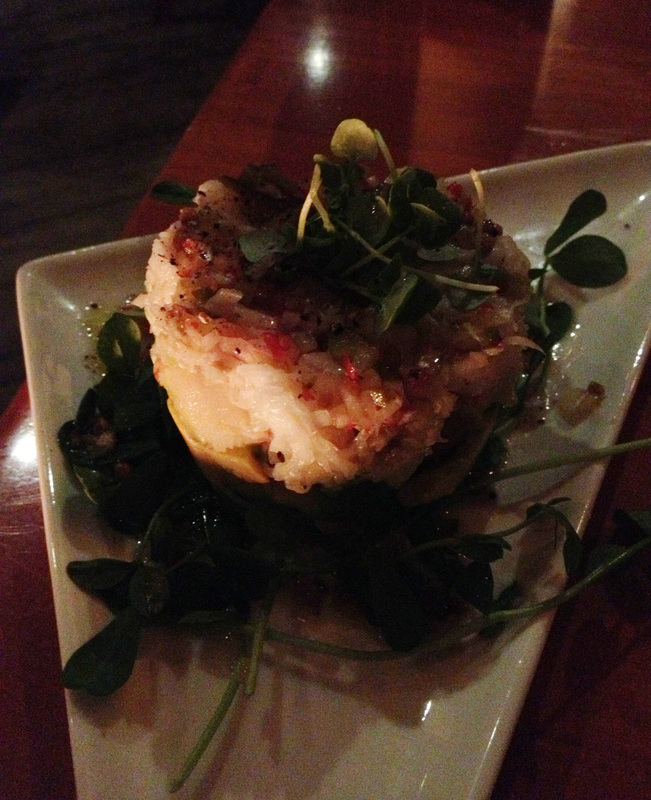 Next up: A pan fried sole, salad of baby poached potatoes, grapefruit, arugula, saffron vinaigrette. This was probably my least favorite dish of all, but I still liked it, so that’s not much of a complaint. 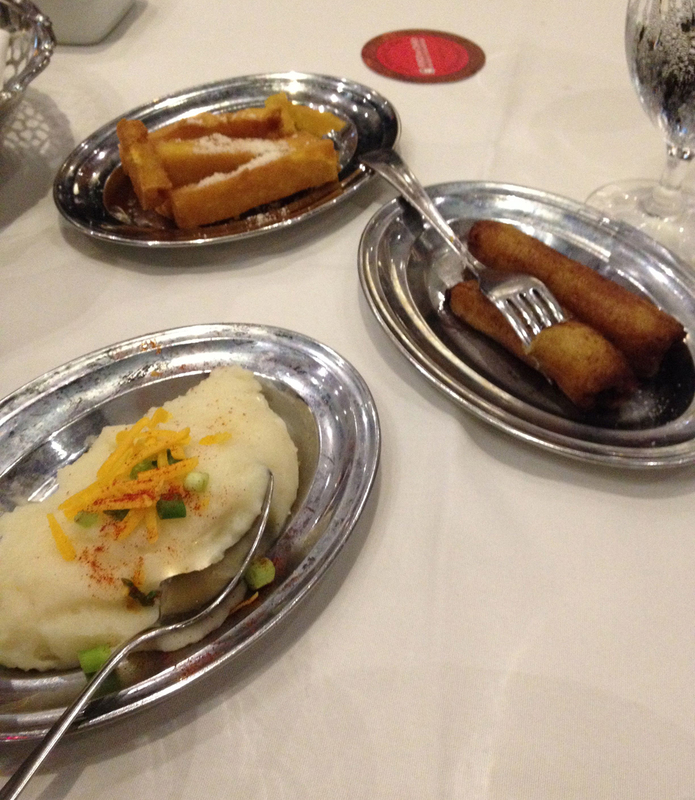 I just felt like the potatoes were a little clunky and didn’t belong on the plate with the fish. 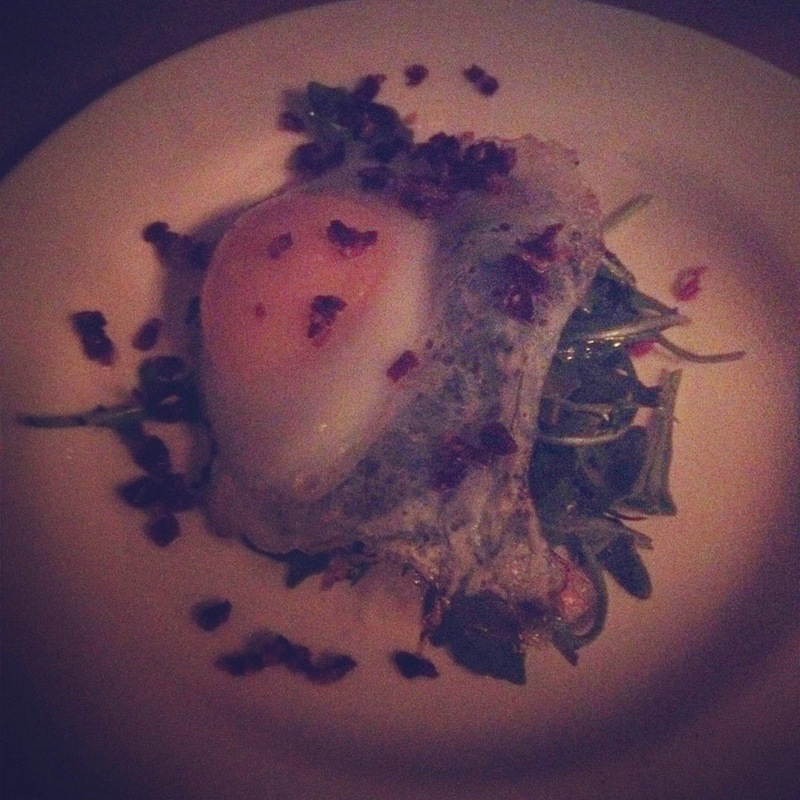 Dessert #1: Huevo: Fried duck egg, crispy Iberico bits, toast. It was such a simple dish, but the quality of the ingredients and the richness of the duck egg combined with the Iberico was very rich and indulgent. 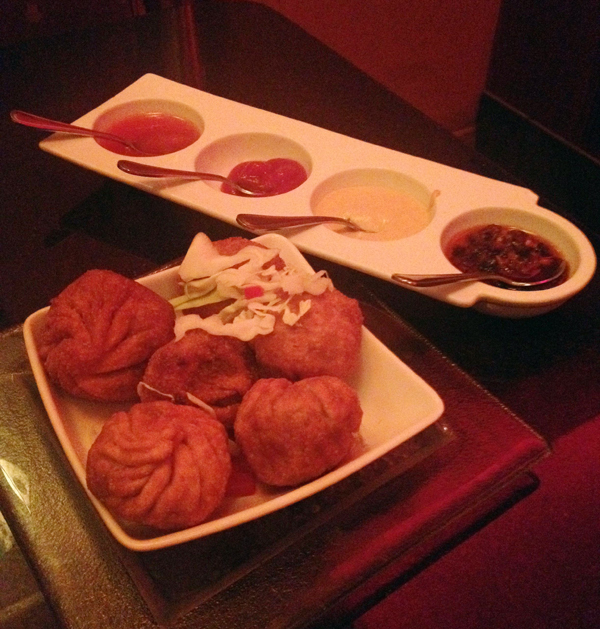 Highly recommended as a starter dish or for a grand finalé! Dessert #2! Again with the eggs, ha! 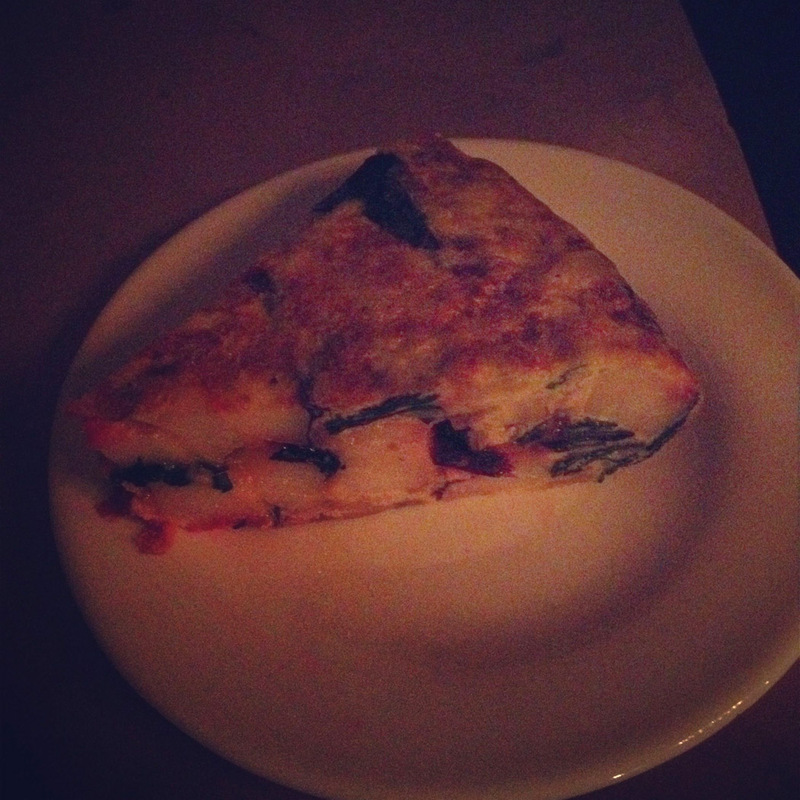 Tortilla: Potato, egg, onion, sea salt. What to drink? Mundaka serves a “Party Wine” house wine (red blend) poured from a giant bottle for $5 a glass (if you don’t ask what is in the blend). 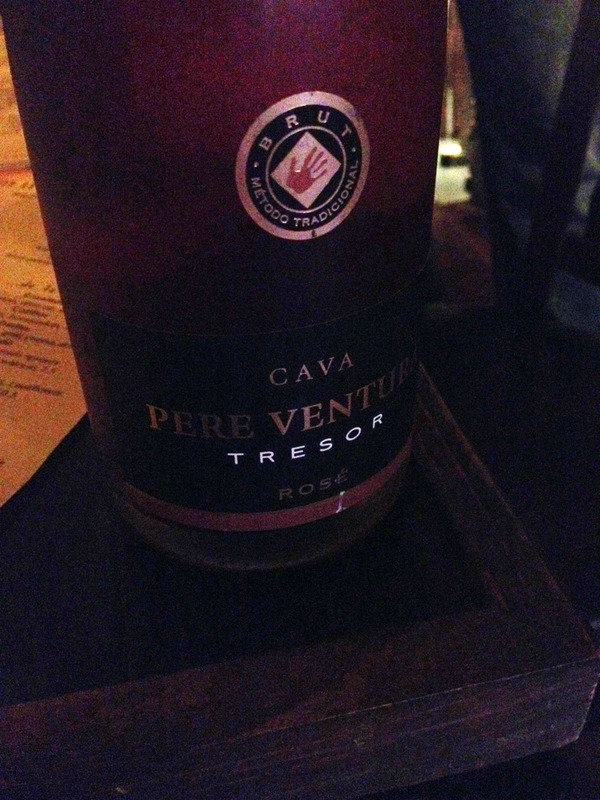 We enjoyed 2 different cavas (one, a rosé) and switched over to the Party Wine later in the meal. 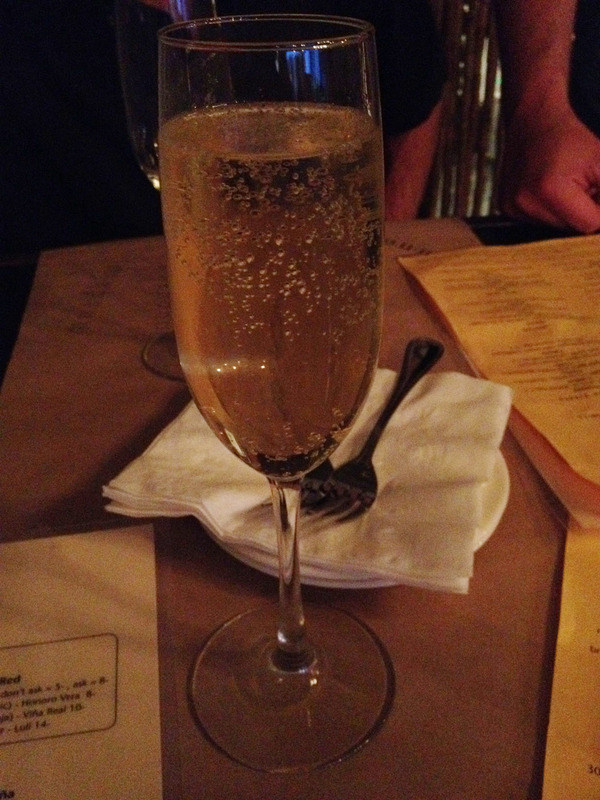 (Below is a photo of the bottle of sparkling rosé that Andy ordered and the glass of cava that I ordered). Mundaka uses organic, local, free-range, line-caught, sustainable, fair-trade ingredients, and DOESN’T use ingredients containing hormones, pesticides, high fructose corn syrup, or anything artificial. That’s so Paleo! Mundaka is located on San Carlos Street between Ocean and 7th Ave and open daily from 11am-5pm for coffee/lunch/pintxos and open daily at 5:30pm for Tapas/pintxos. 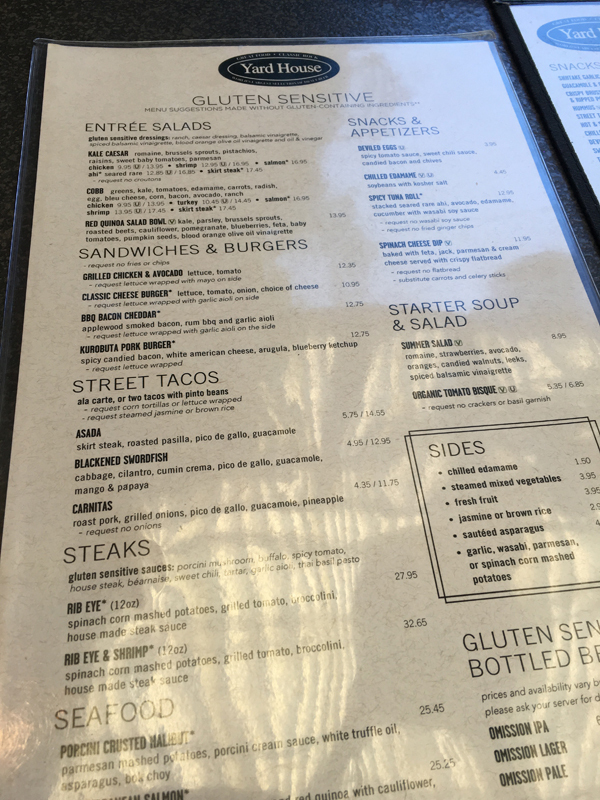 You can download a sample menu here. You can find Mundaka on Facebook here. 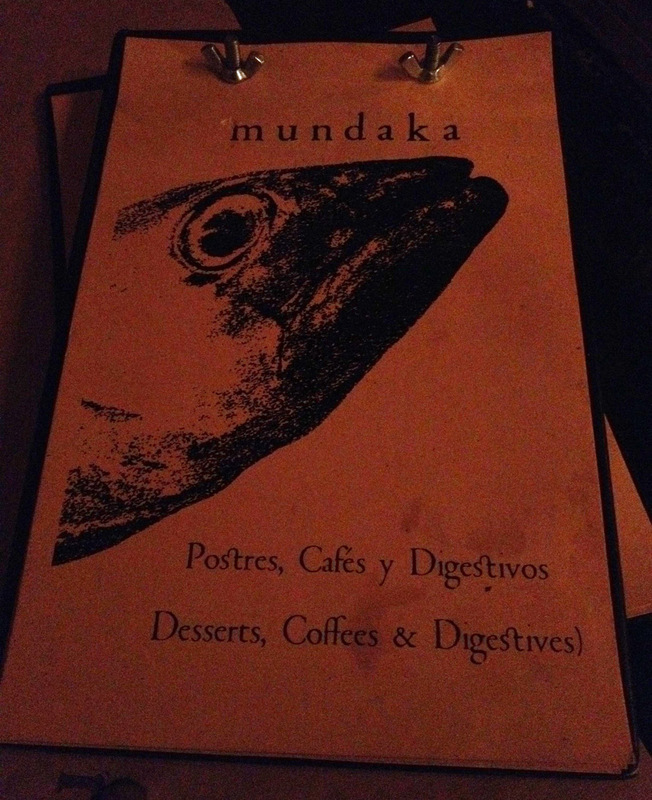 You can make a reservation at Mundaka via Open Table here. OK pinch me, because I must have been dreaming. 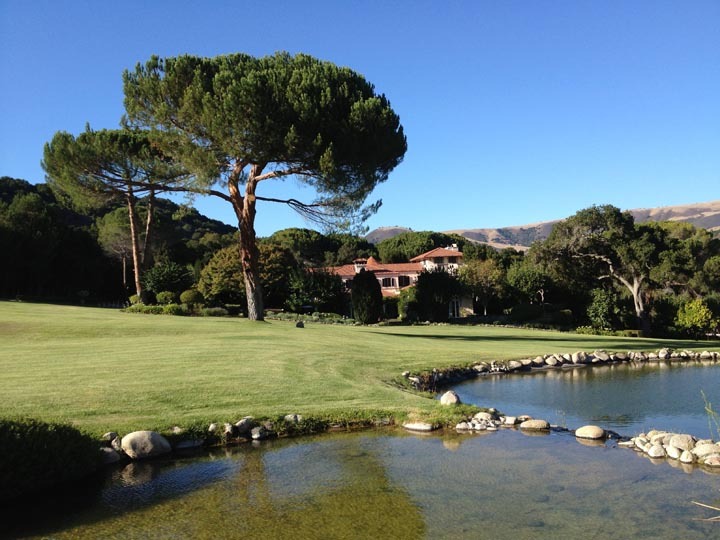 The latest cavegrrl.com getaway was to the idyllic Stonepine Estate Resort, located in Carmel Valley. 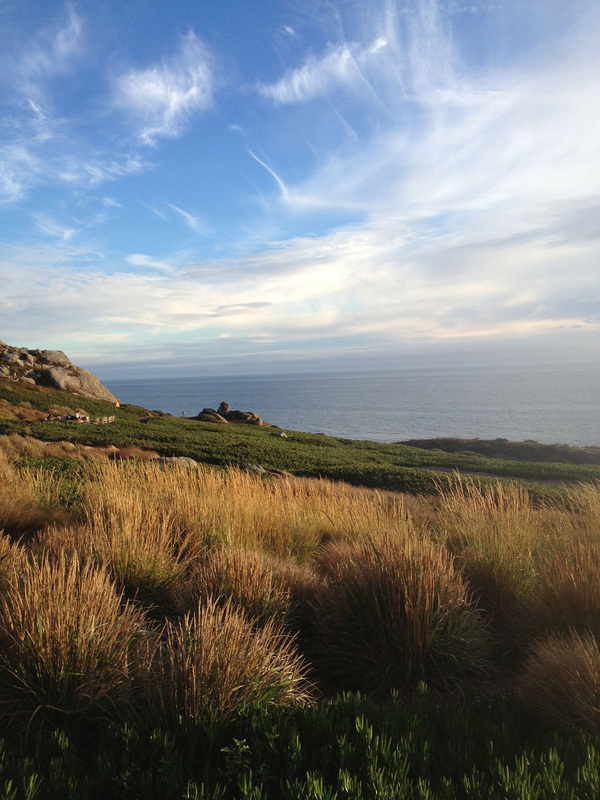 Carmel Valley is twelve miles inland from Carmel, (its more celebrated sibling). To be honest, I preferred Carmel Valley because of the sunshine and warmer temperatures. The Estate boasts 330 secluded acres of gently rolling oak-studded hills, an affiliation with the Historic Hotels of America (formerly Relais & Chateaux). The Mediterranean-style Chateau (pictured above) is framed by 12 formal gardens. 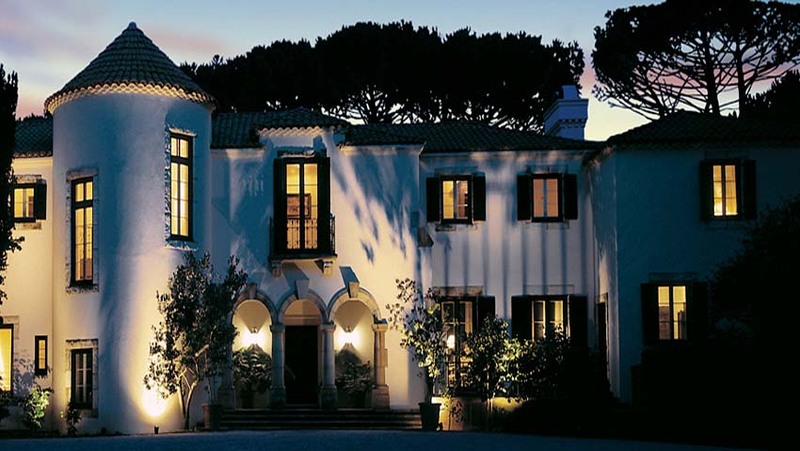 Chateau Noel includes eight luxuriously appointed suites, each lavishly named and decorated (with namesakes’ approval) after the Hentschels’ (the current owners of the Estate) favorite designers, champagne, china, jewelry, honeymoon location, philosopher and artist. There are also four cottages on the property: the Briar Rose, the Paddock House, the Gate House and the Hermes House. 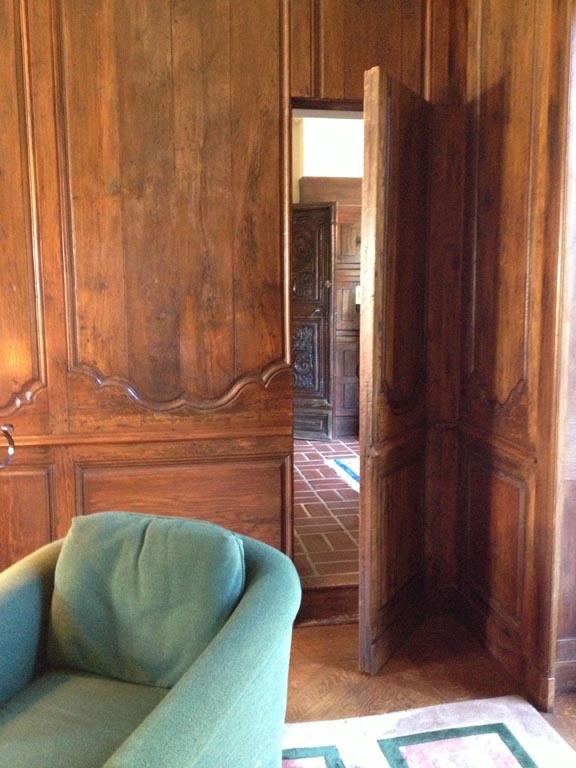 We were treated to a stay in the Don Quixote suite, which is actually hidden behind the wall of the library on the first floor of the Chateau Noel. The suite features a separate sitting room with fireplace, king bed, two bathrooms and French doors leading to a secluded garden and patio. 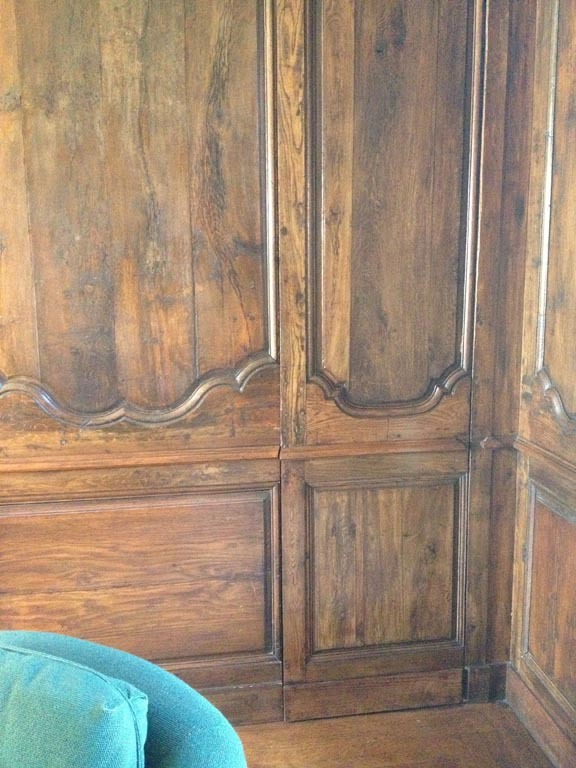 The Don Quixote suite is hidden behind this wall. 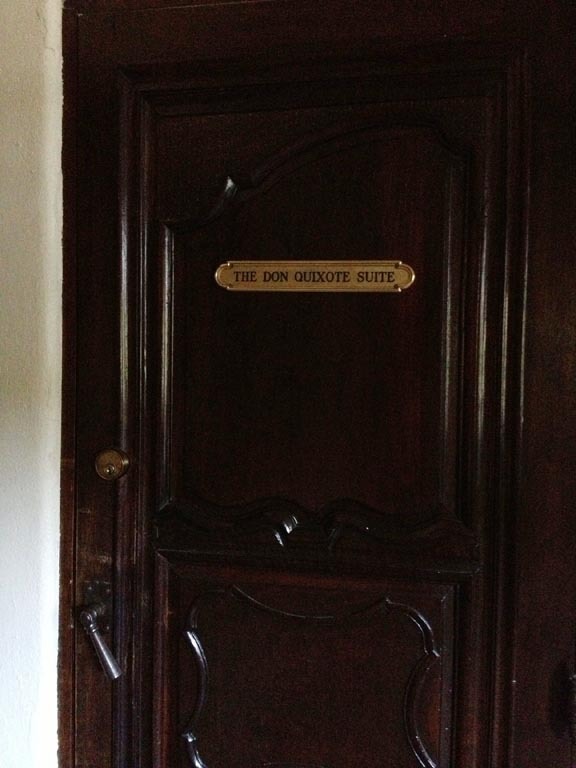 The doorway to the Don Quixote Suite. 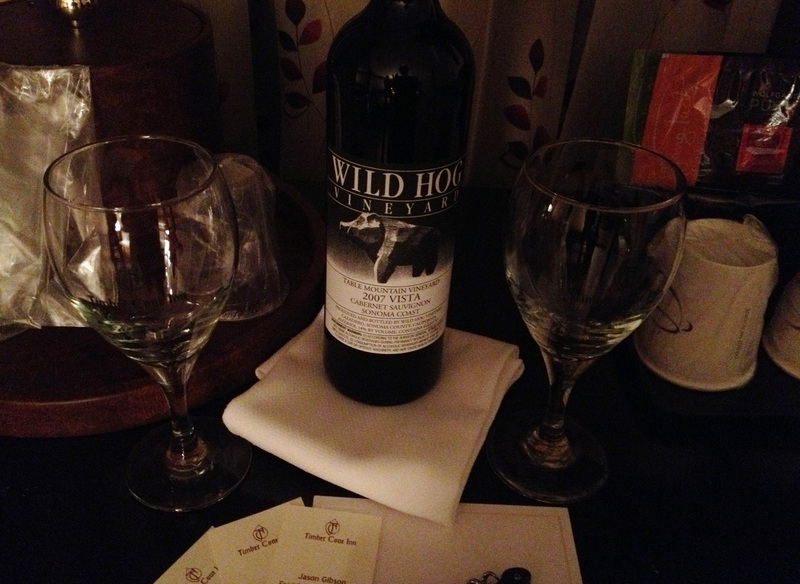 Our welcome amenities: a few snacks and a bottle of wine, a Hahn Cabernet Sauvignon. 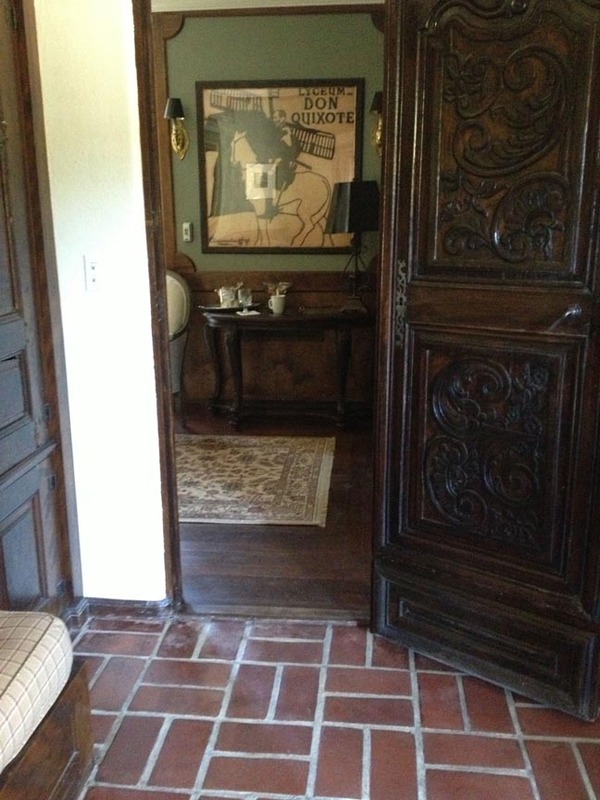 The card pictured above was a note from the owners of the Estate, Gordon and Noel Hentschel. 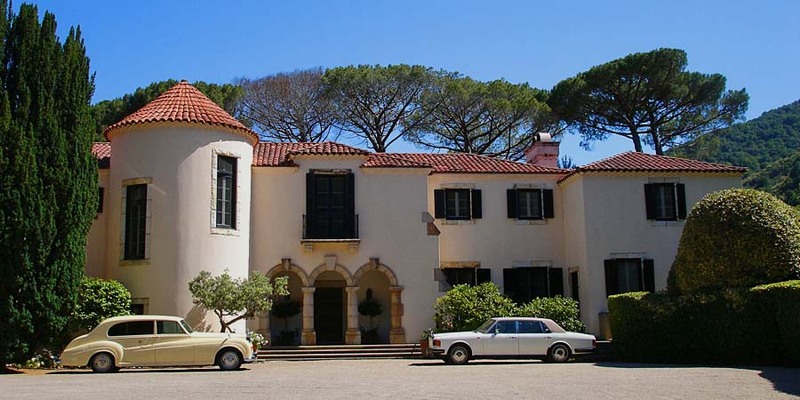 They purchased the Estate in 1983 and restored it in 1987. Andy and I already felt welcome and knew we were in for one of the best hosted trips I have ever experienced. 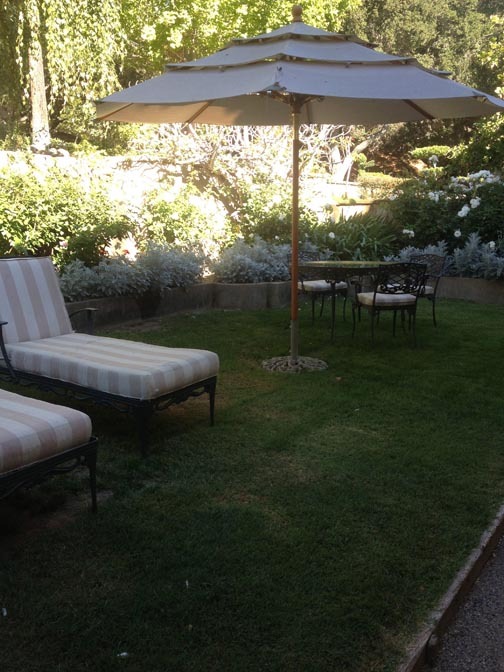 This is the private backyard outside the Don Quixote Suite. Our room boasted 2 bathrooms (a his and hers). 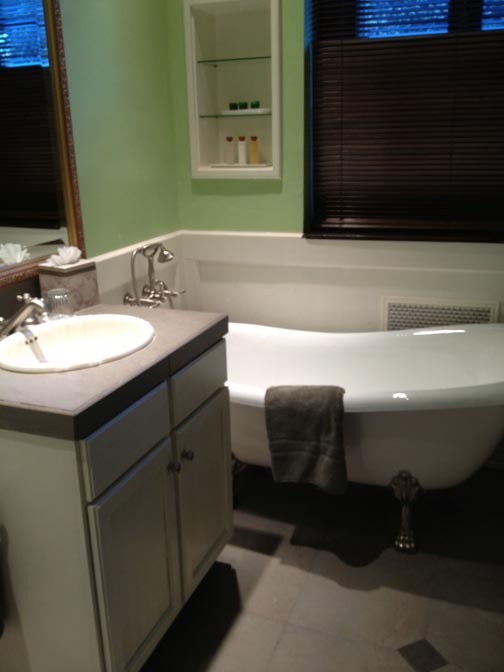 I just love bubble baths, so this bathroom was perfect for me. 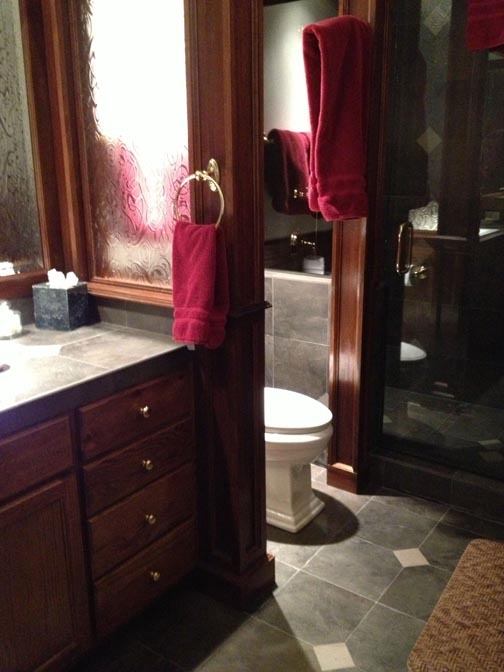 Andy’s bathroom had one of the nicest shower stalls I have seen in a hotel setting. After rubbing our eyes and giggling in delight about the state of our room, we got ready for dinner. 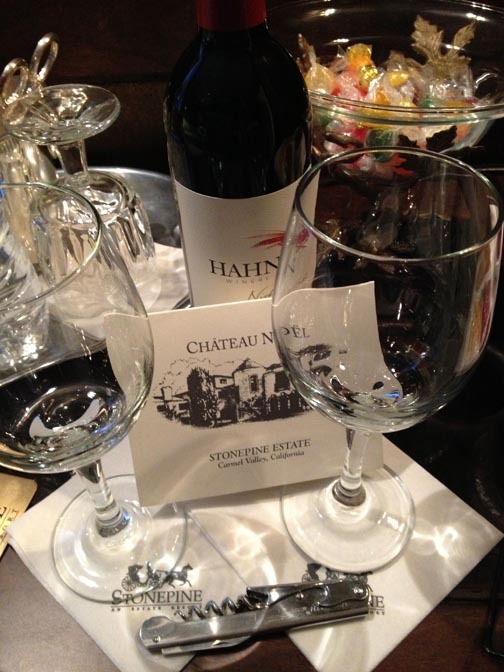 Typically, dinners are held in the dining room, but the staff at Stonepine had something more special in mind for us. 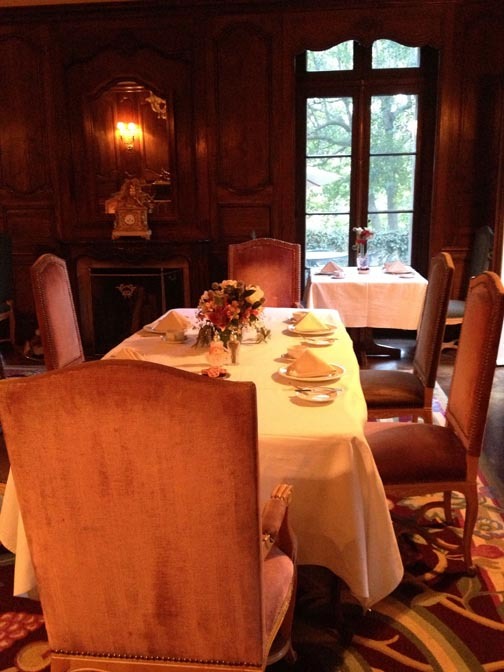 Here’s a shot of the dining room, which is the setting for the Estate dinners. 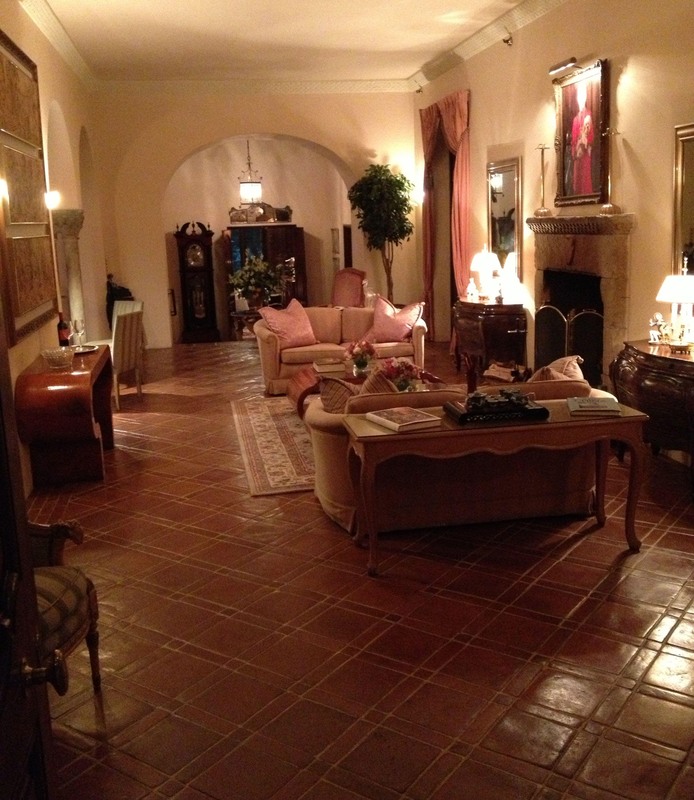 We were led into the great room which has a beautiful fireplace and a piano, to enjoy a glass of wine and some appetizers before our dinner. 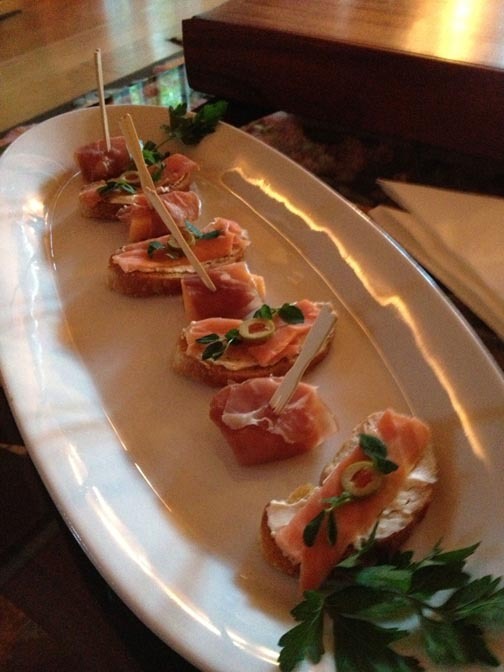 We sat on the couch and were served a plate of melon and prosciutto, and some salmon bruschetta. Here’s Andy at the table, and that is the same wall that opens and leads to our room. 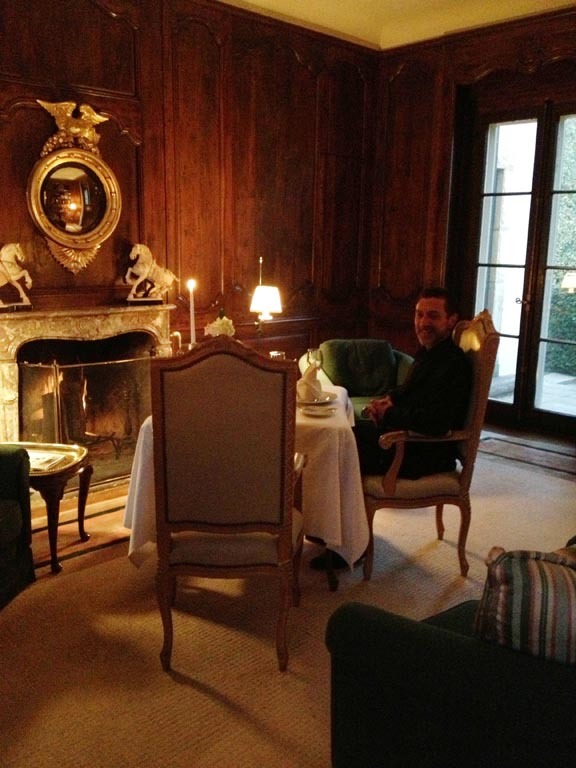 As you can imagine, we were more than happy with the romantic dinner setting. 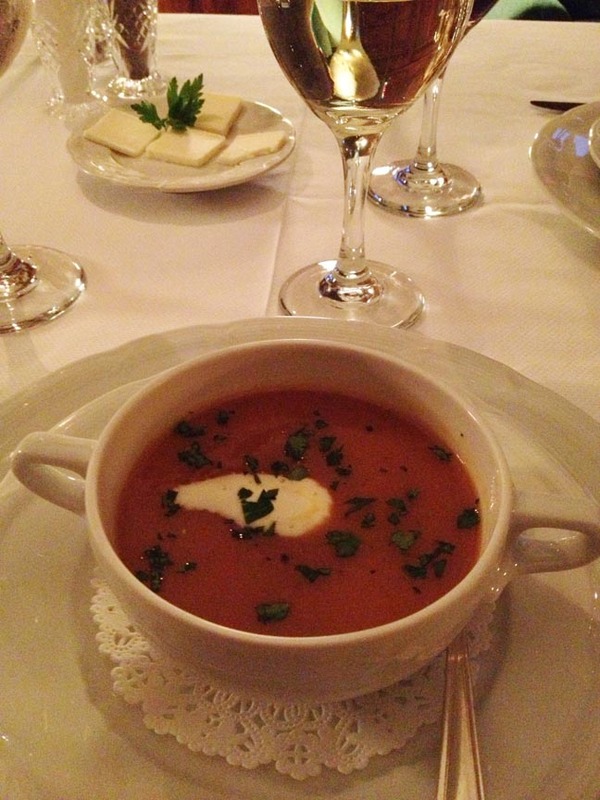 The first course was a butternut squash soup with crème fraîche. 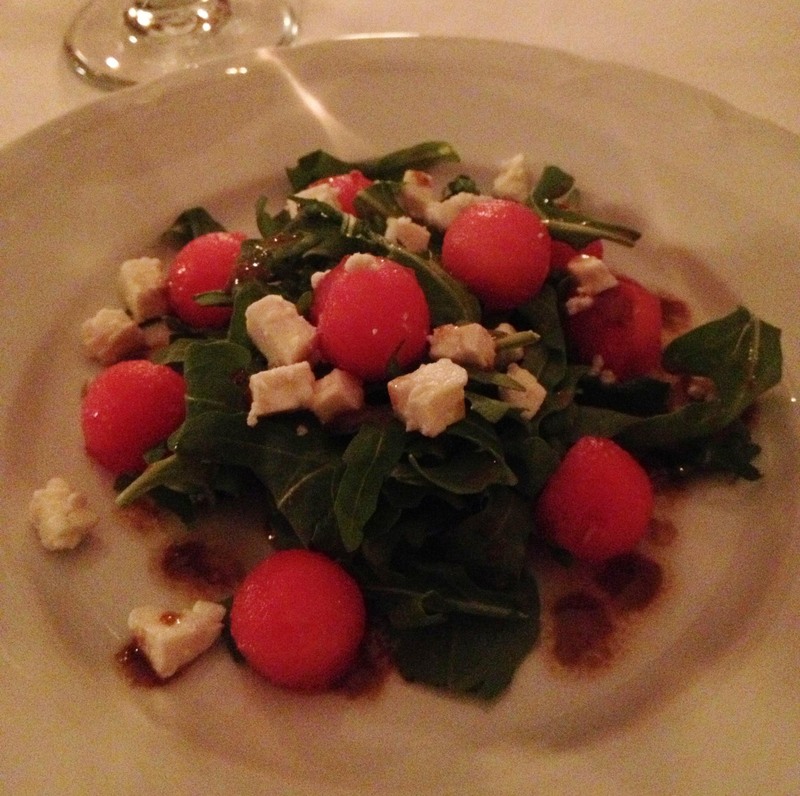 The second course was a salad made of organic baby arugula with watermelon and feta cheese served with a dijon vinaigrette. 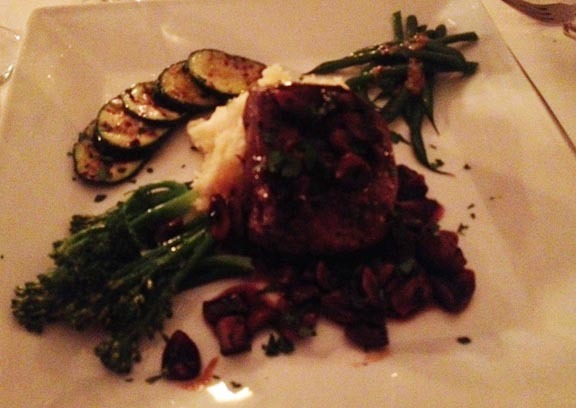 I ordered the pan seared filet mignon with mushrooms and merlot reduction served with a potato-parsnip mash, sautéed broccoli and grilled zucchini. And I was very pleased with my meal as well! Dessert was a chocolate mousse (Andy polished off both of them, and I didn’t get any photos, because dessert just isn’t my thing (anymore) 😉 However, I did enjoy another glass of wine and time together in front of the fireplace with Andy. The whole setting was just unbelievable/surreal, and you have to experience it someday yourself. Then it was off to breakfast. 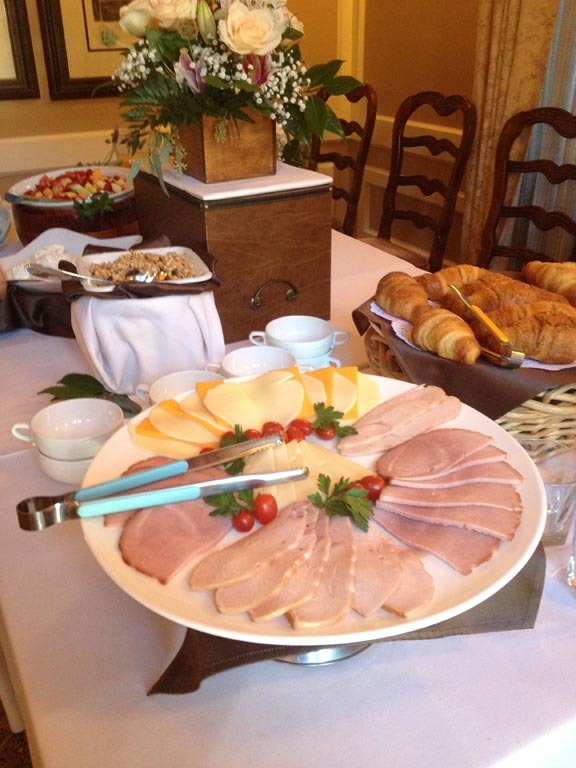 I loved the buffet spread. Plenty of Paleo options!! My favorite was the fruit salad. It had the best raspberries I have ever tasted, so I am pretty sure they were local and probably picked within a day of serving them. 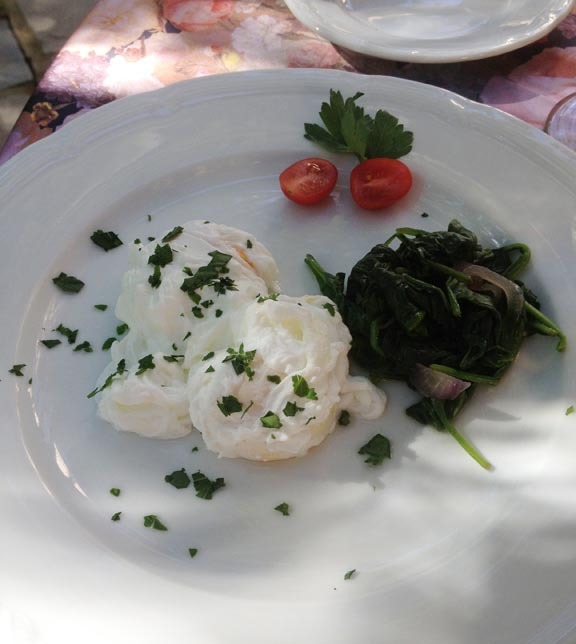 Andy and I also ordered two poached eggs each, which I have found is the safest way to order eggs so that they don’t come cooked in butter or some strange oil. 🙂 They were served with a sautéed spinach and onion mix and some tomatoes. We chose to sit outside that day. I can’t say it enough, but the weather cooperated so much that weekend. It was just nice to sit out in it as much as possible. 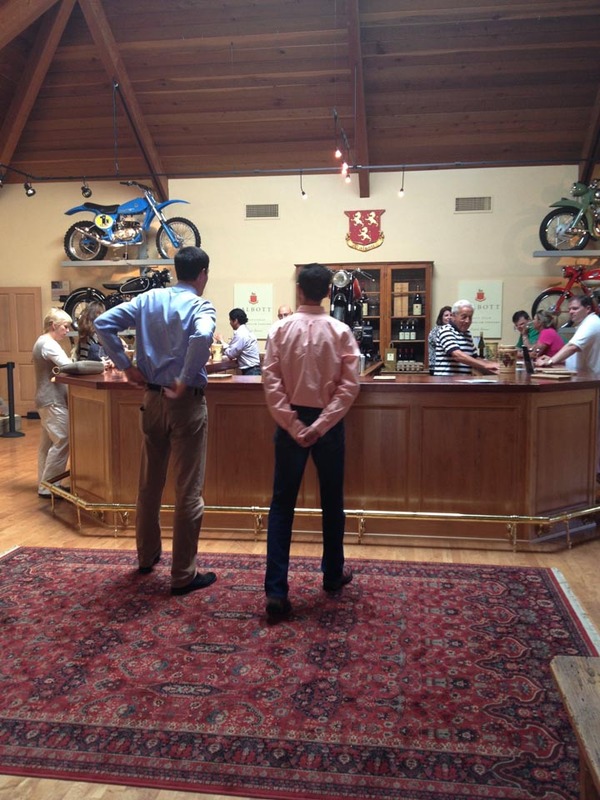 Then a few hours later, our concierge Jordan took us wine tasting in downtown Carmel Valley. That’s him on the right. 🙂 He’s from France and pretty familiar with the grape! 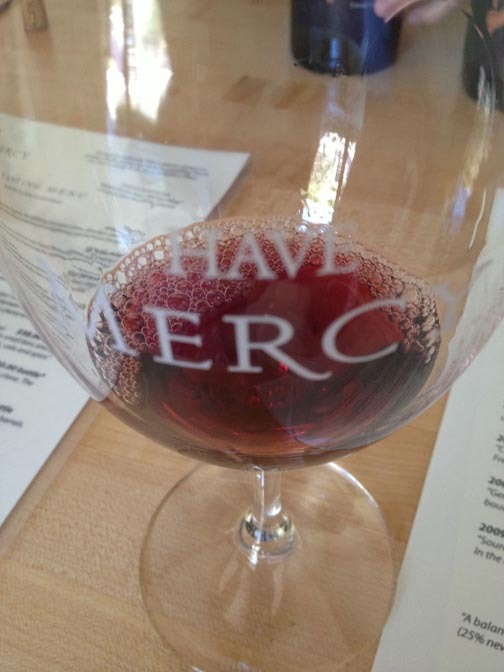 Our first stop was Mercy Vineyards Tasting Room located at 40 W Carmel Valley Road, Unit A, Carmel Valley. 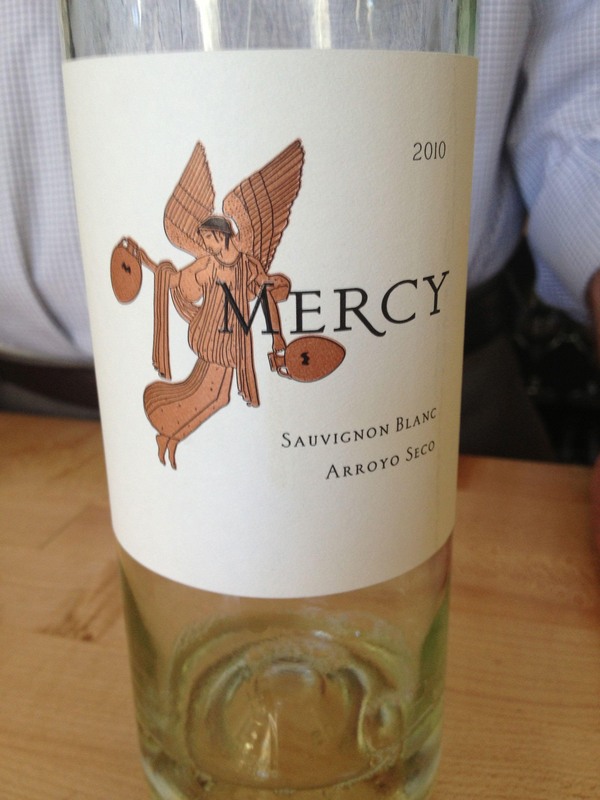 All the wines at Mercy showcase the Monterey County Arroyo Seco AVA and are sourced from three contiguous vineyards, all located in a specific part of the appellation – the dried riverbed. The partners at Mercy come from Foley Estates. The vintners Mark and Mike have known each other over ten years and combined have been in the wine industry for over 45 years. They specialize in chardonnay and pinot noir, but also make a sauvignon blanc and a syrah. 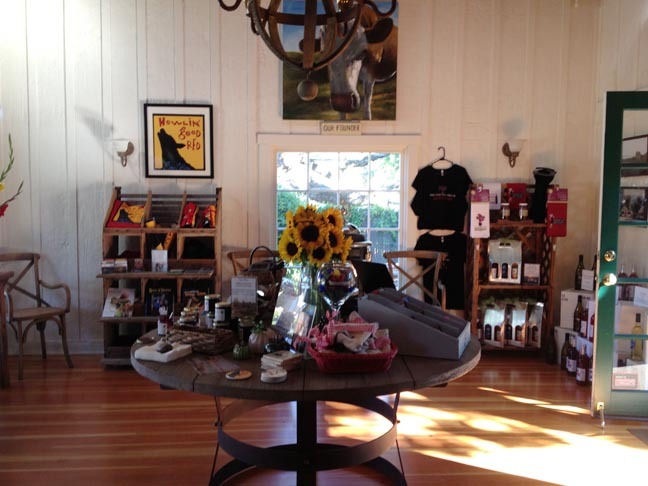 They are open for wine sales and tasting Thursday-Sunday, 11:30am-4pm. Our next stop was Talbott Vineyards. 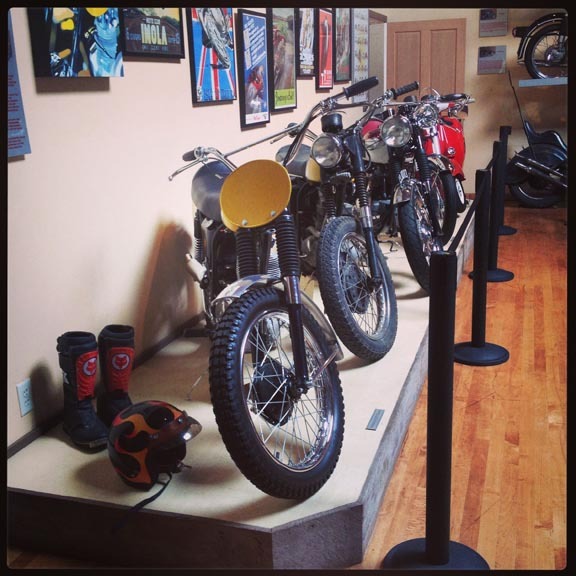 (25 Pilot Road, Carmel Valley Village) Their tasting room is decorated with a menagerie of bikes and things with wheels, all lining the walls and hanging from the ceiling! Talbott Vineyards is an estate winery that grows & produces Chardonnay & Pinot Noir from two of Monterey County’s grand cru sites: their Diamond T Vineyard in Carmel Valley & the Sleepy Hollow Vineyard in the Santa Lucia Highlands. 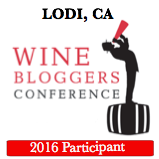 The winery was founded by Robb Talbott, and the wines are crafted by Dan Karlsen. The folks at Cima really made an impression on me, and I wanted to let you know about their event on October 12th. 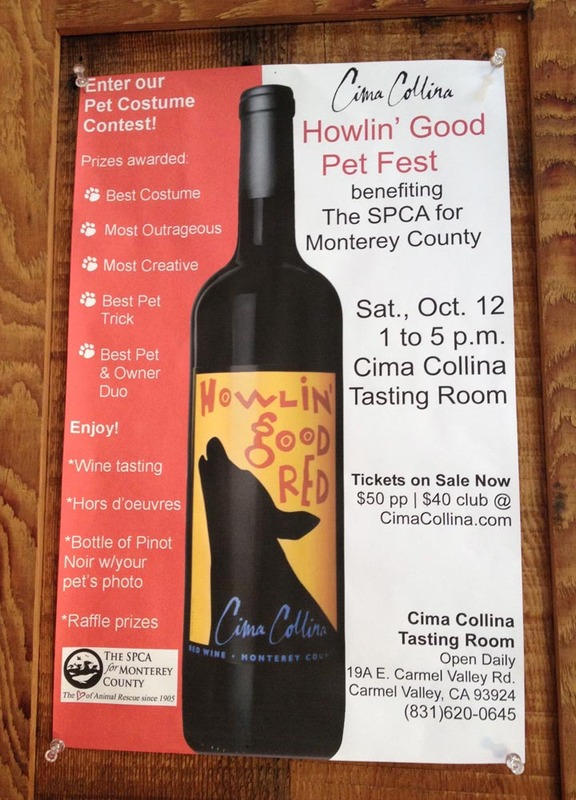 It’s a fundraiser for the Monterey County SPCA, so if you are in the area and are an animal lover, this is the event for you! See the poster in the photo below for details! After all that tasting, I was ready to relax. Jordan drove Andy and I back to the chateau at Stonepine. 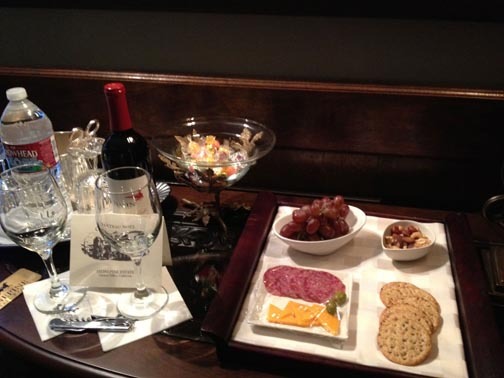 We relaxed in our room for a little while ;), then shortly after, we walked across the lawn to the Waterfall Pavilion and were treated to an afternoon happy hour wine and cheese presentation. 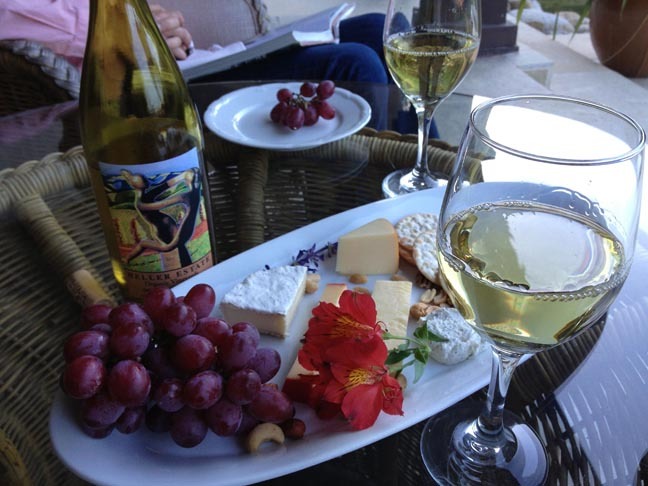 Jordan prepared several cheeses for us to sample along with a bottle of local Chardonnay by Heller. #magic #ilovecheese #jordanhowdidyouknow?? 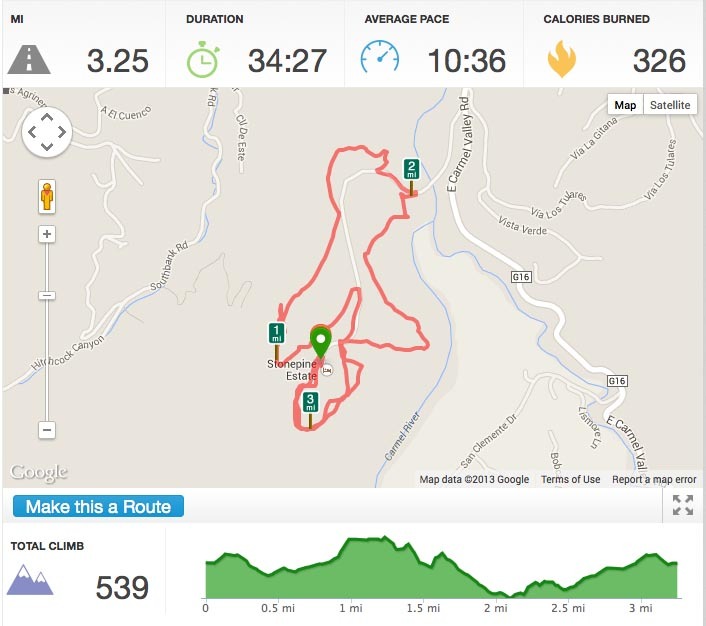 Not the fastest run of my life, but at least it was a workout. 🙂 After we cleaned up, we headed for breakfast number two. I was feeling a little sad because it was almost time to leave Stonepine, and this is not a place one is eager to leave! This time for breakfast Andy and I ordered an omelet and two bowls of fruit. OK, I eat like a truck driver sometimes. Don’t judge. 😉 I gave Andy my croissant (he needed it more than I did, although I did take one bite of it). 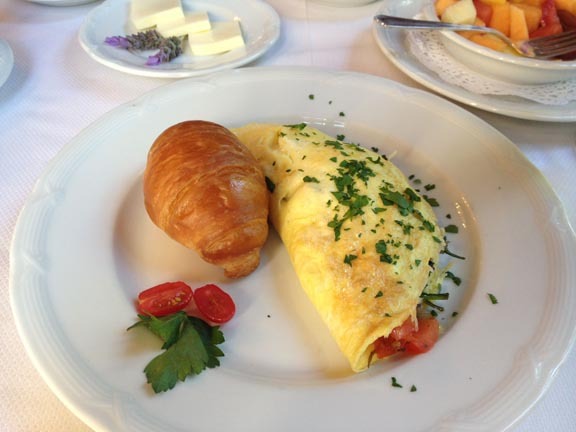 It was superb, but my omelet was even better, and once again, the fruit was so good: a mixture of 3 kinds of melon, pineapple, strawberries and raspberries. And bottomless coffee. We were spoiled! 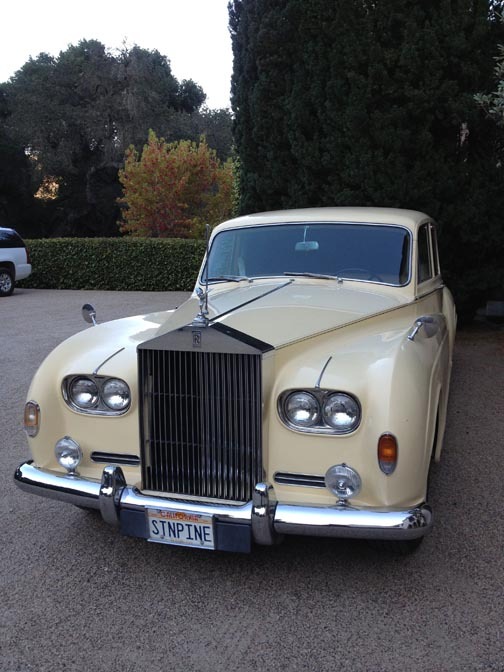 One of two Rolls Royce owned by Stonepine Estate. View from the Tattinger Suite. The grounds view from the back of the house. The bar that was adjacent to our room. Andy and I have agreed we will come back to Stonepine (annually, perhaps), as we love Carmel Valley so much. It’s funny because I didn’t know such a place existed even a year ago, yet so many celebrities ( Johnny Depp, Clint Eastwood, Tom Cruise, Nicole Kidman, Diane Sawyer, Brooke Shields, Bill Gates, Jim Carrey, Renee Zellweger, Warren Buffet, The Rolling Stones, Shakira and Joe Montana) have made Stonepine their destination. Now I know why. It’s a very special and private place. Once you are past those gates (and believe me, it’s a high security place for people who don’t want to be seen), it’s like stepping back in time, even into another country. I can’t say enough about the kindness of the staff at Stonepine. They are all people I hope to see year after year. Thank you to Relevance PR for arranging my visit and a huge thank you to Gordon and Noel Hentschel for accommodating us. 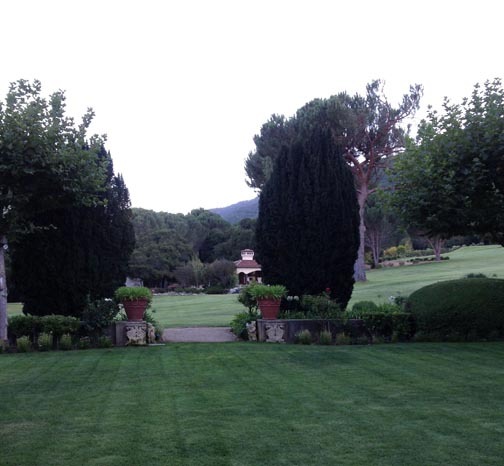 Stonepine Estate is one of the most lovely places we have ever experienced and I look forward to our return. 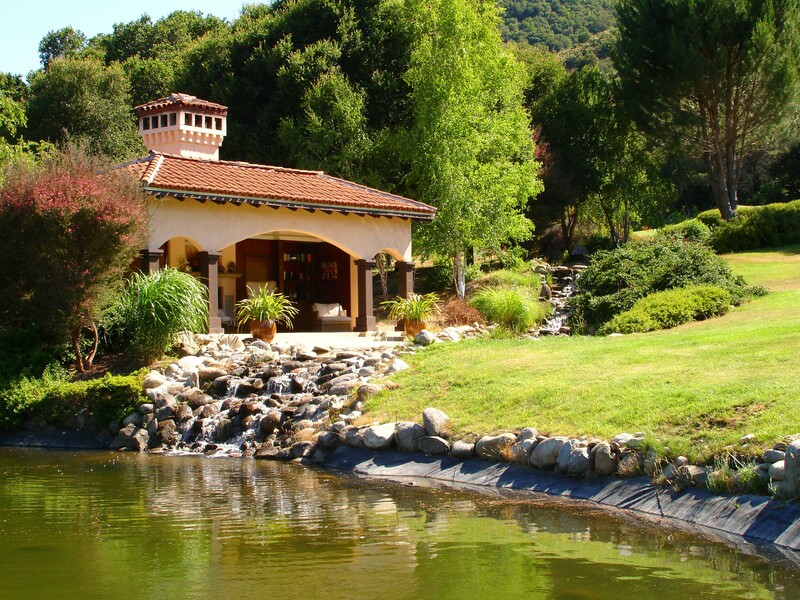 You can find Stonepine Estate on Facebook here and follow them on twitter here. For more information on accommodations and room rates, click here or call 831.659.2245. I first became aware of the Timber Cove Inn last June through a press release that was sent to inform me of their 50th anniversary. The restaurant inside the Inn, Alexander’s, was serving a pre fixe dinner menu and throwing a Mad Men-era party in honor of the anniversary. I was intrigued, and after a few emails back and forth with the marketing company that sent me the release, I was invited to stay at the Inn last weekend (August 24 & 25th), as well as try a great deal of food at Alexander’s. I can’t say enough about the hospitality of each staff member and the incredible food Andy and I enjoyed at the restaurant. I (and Andy as well for that matter) really got the star treatment without being intruded upon, and the trip was completely private and relaxing. 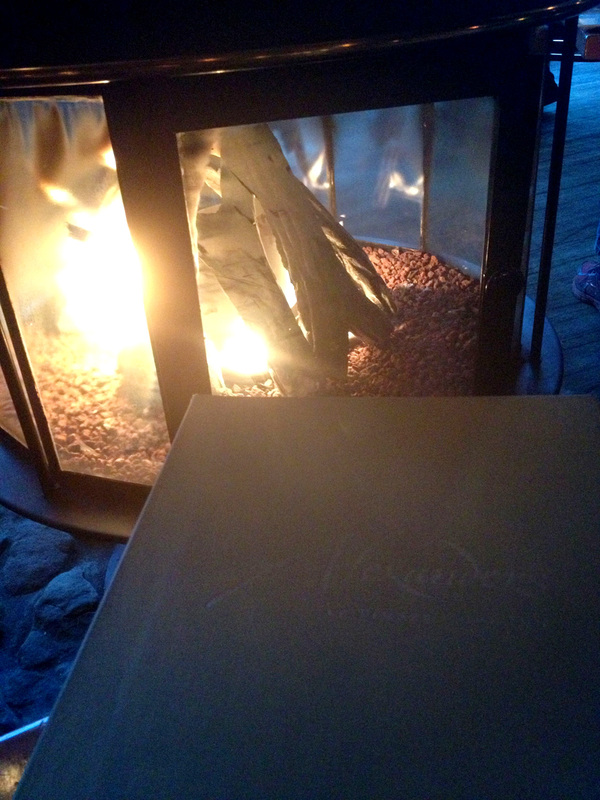 We arrived at Alexander’s for dinner and were seated right next to the fireplace just as the sun finished setting. The restaurant dining room overlooks the ocean and provides a view from most of its tables. The pre fixe menu was still available as an option, but Andy and I stuck to the regular menu for both nights. 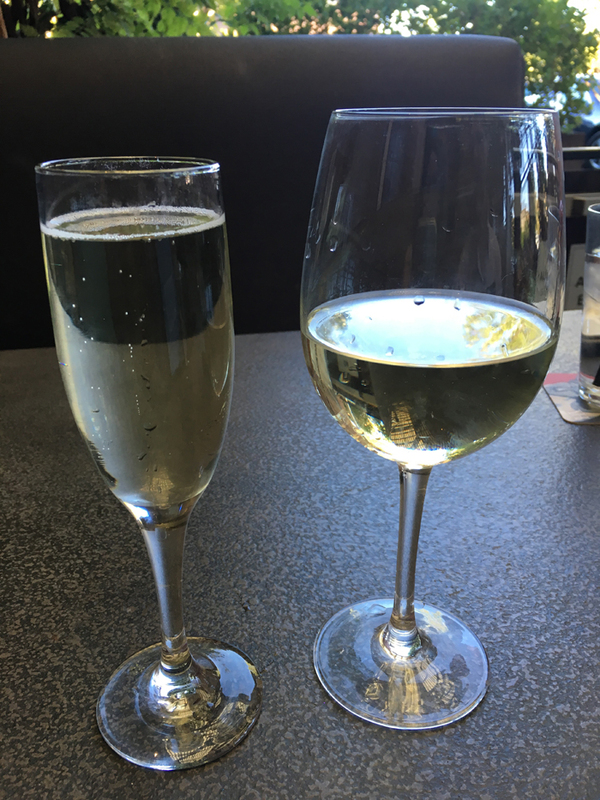 We kicked off the meal with a glass of wine each (I had a sparkling wine, Schramsberg, and he had a glass of Flowers Chardonnay). 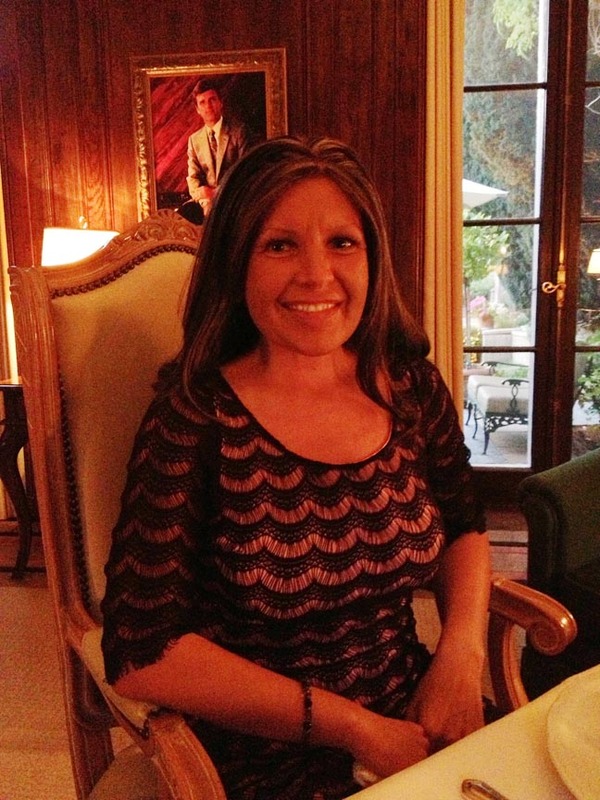 Our waitress for our two night dining extravaganza was Stacy. If you’re lucky, she’ll wait on your table, too. Stacy knew the food menu as well as the wine menu very well, despite being a non-drinker. 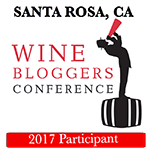 She has traveled to many of the tasting rooms (as the list is predominately if not all Sonoma County wine), and tasted most of the wines featured on the list. 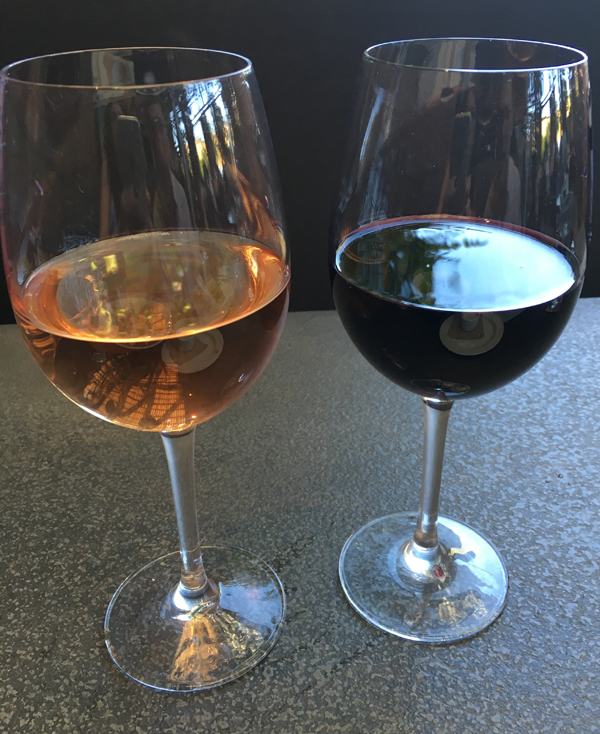 We selected the Fort Ross Pinot Noir because of our entrée selections (cioppino and pork), and sipped on our starter whites while the appetizers began to arrive. The next plate we chose was a Local Roasted Beet Salad with crumbled Chèvre, Almonds and a Sherry Vinaigrette. I really loved all the green on the plate and the two different colors of beets the chef used. 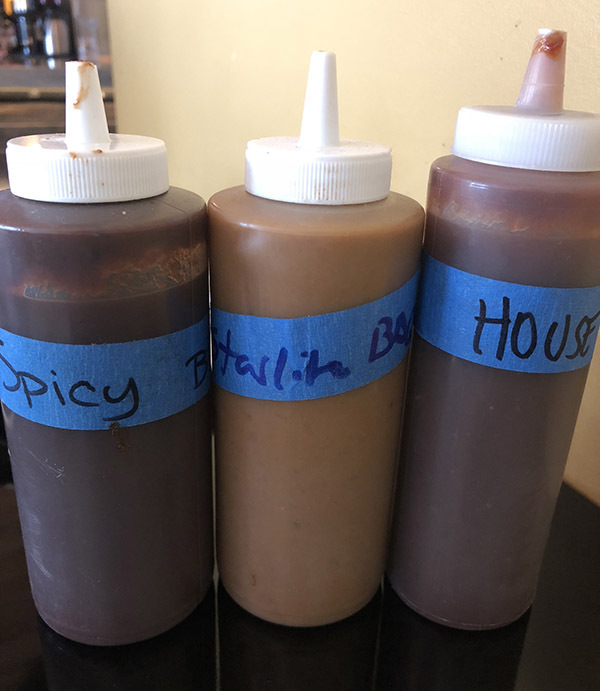 The vinaigrette did a great job of corralling all the flavors. 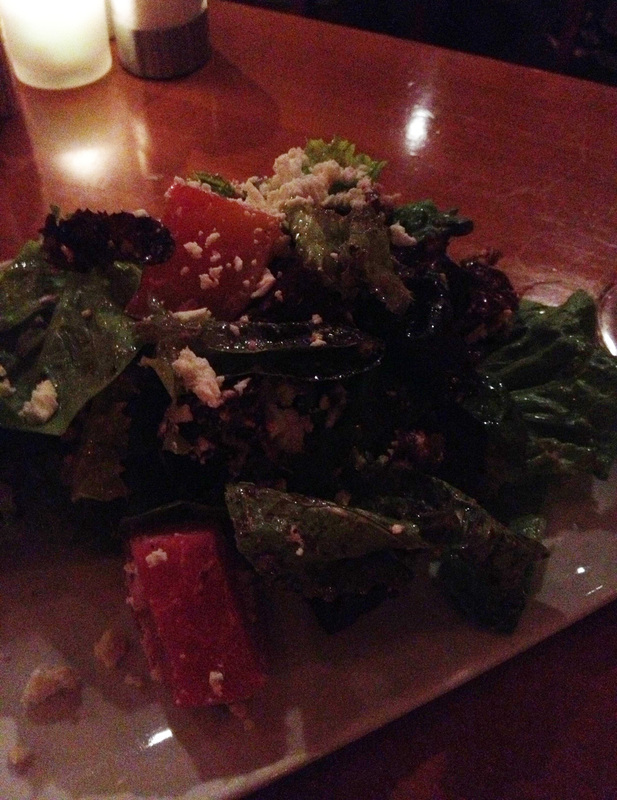 I liked this salad so much, I almost ordered it again our second night at the restaurant. 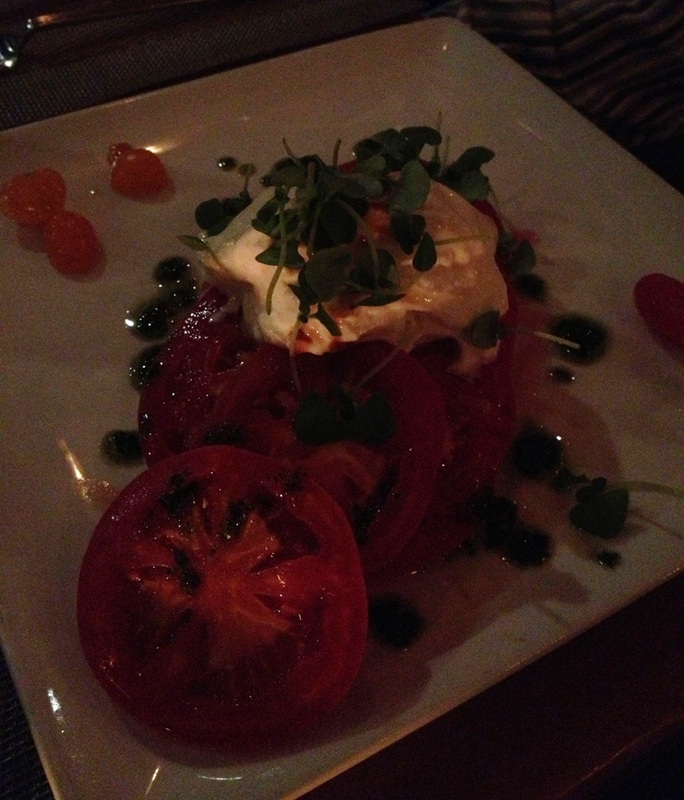 The last appetizer we chose was a Caprese Salad with Heirloom Tomatoes, Burrata Cheese and Golden Balsamic Reduction. This was a stunning presentation and tasted even better. The cheese was made fresh that day and it was creamy and salty, which was just the right balance for the acidity of the tomatoes. 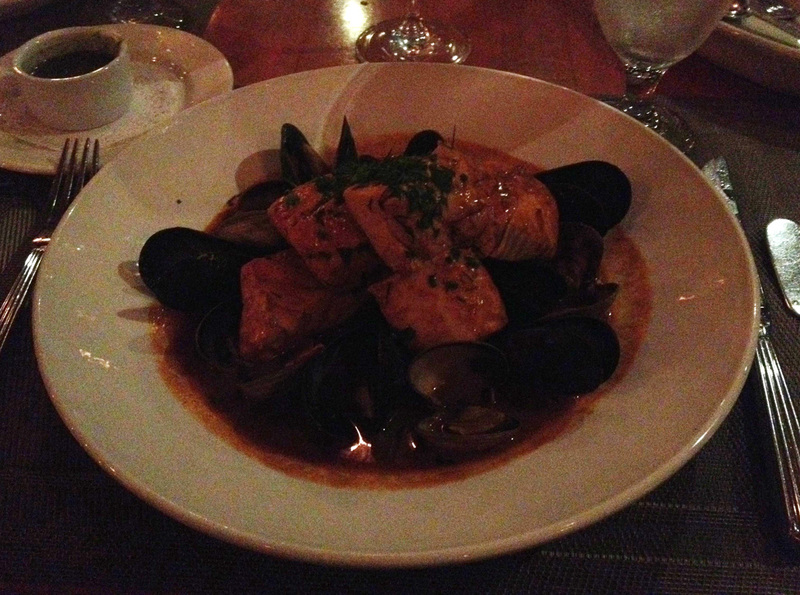 Andy went with the Cioppino for his entrée, a mixture of clams, mussels, and huge chunks of tender salmon resting in a zesty tomato broth. Definitely a paleo dish if I ever saw one. Our wine selection was a Pinot Noir by Fort Ross Vineyard “Sea Slopes”. It was very full bodied for a pinot noir and could have even been paired with a steak. 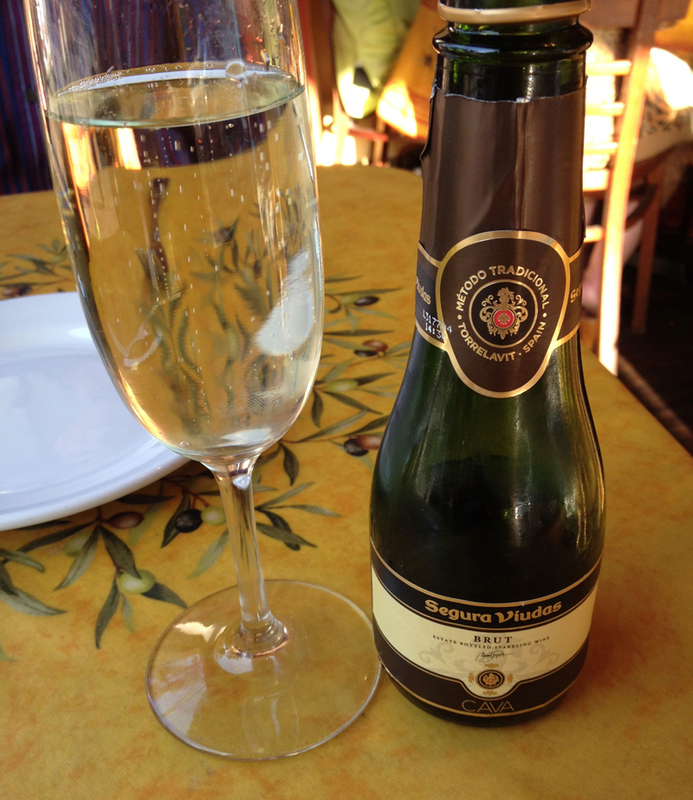 The wine also received a “95, Editor’s Choice” rating in Wine Enthusiast. 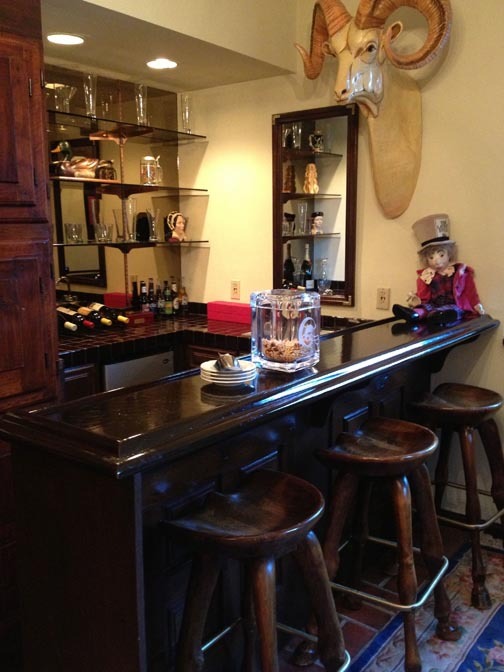 The winery is located fairly close to Timber Cove Inn, off of Myers Grade Rd. I went with the Grilled Pork Chop served with Mixed Local Beans on a bed of Sweet Potato Mashers and topped with Arugula Slaw with a Dijon Jus. Once again, everything on the plate was in complete harmony. My entrée could almost be referred to as comfort food, but with a modern twist. And comforted I was! 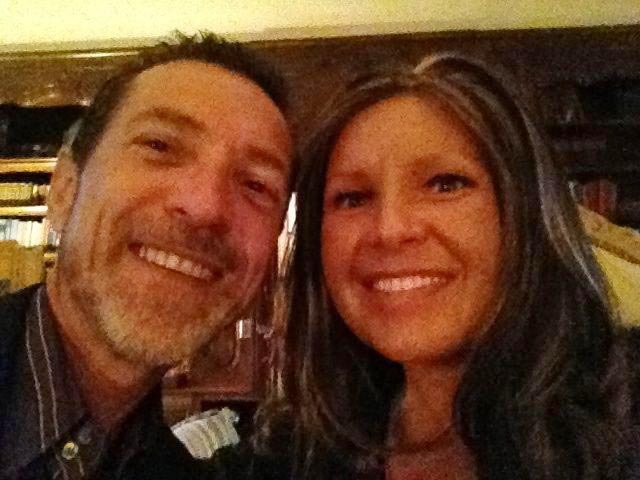 I was so happy to be there, sitting beside my favorite person in the world and having dinner on the ocean by the fire. And just I stuffed my mouth with a huge bite of pork chop, guess who walks up? The chef. 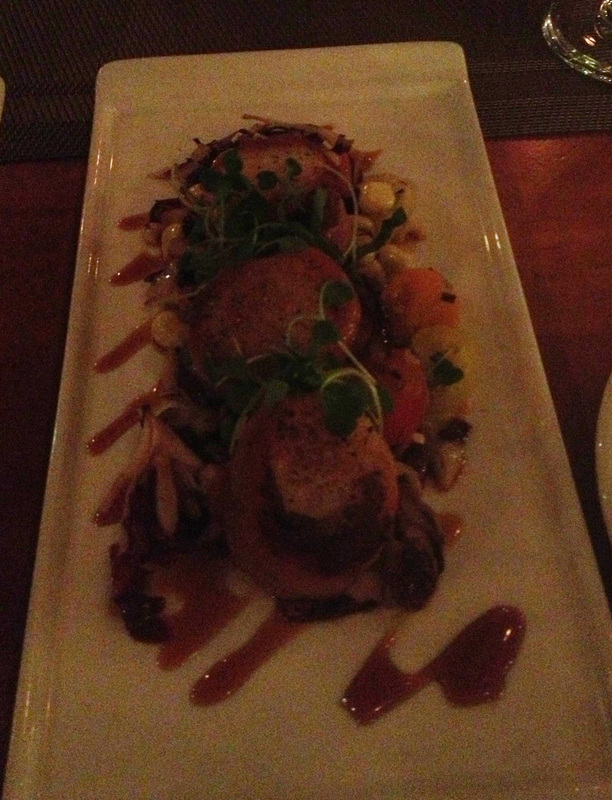 Um, embarrassing… Yes, we were well into the bottle of wine and happy as pigs when Chef Oliver came to the table. I remember being very enthusiastic about the meal, indeed. Of course, he was happy that we were happy. Then, we arranged to meet the next morning to chat more about the restaurant. Tired, but happy after our welcome meal, we went back to our room, and great bottle of local wine and a king size bed was there to greet us. The next morning, I hit the gym to do some damage control on all the calories I would be taking in over the weekend. 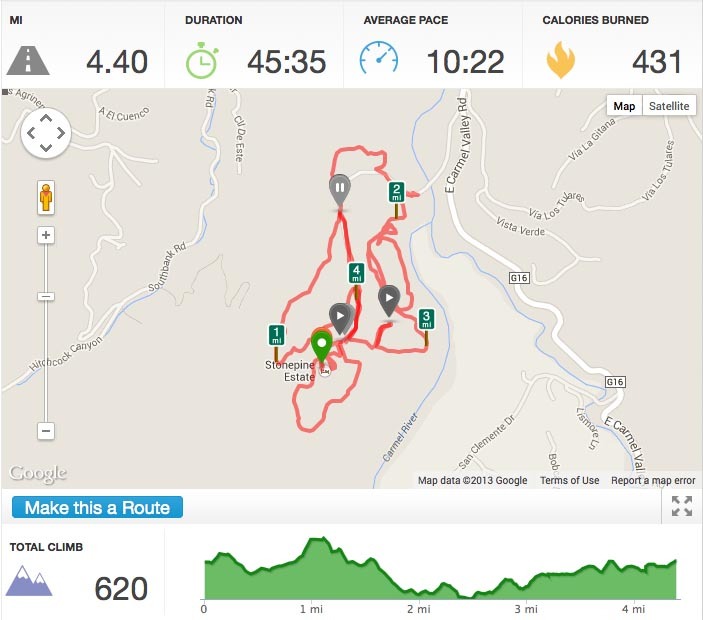 You have to pay to play, and Timber Cove Inn had just what I needed to burn some calories. 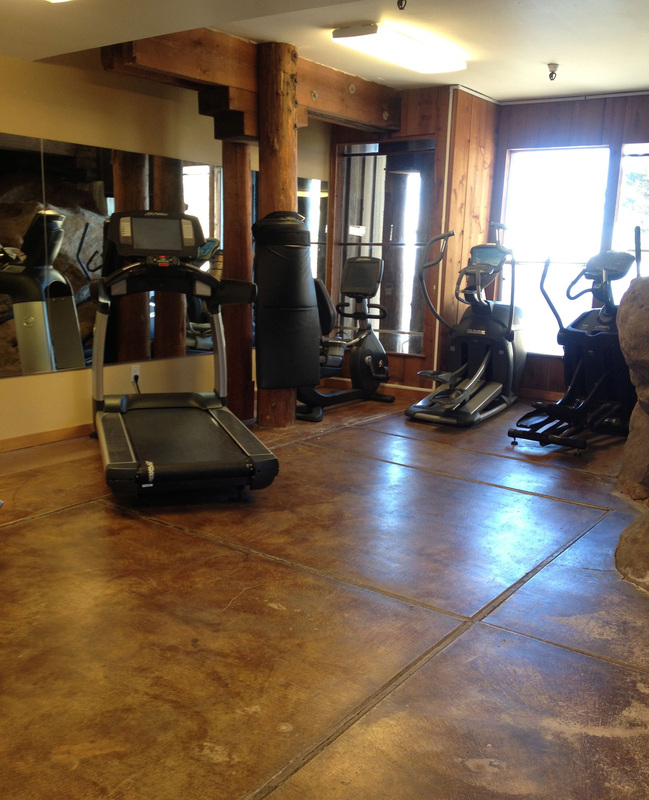 It’s a small gym, but the equipment is great and so is the view from the elliptical machine. Arrive early to hog the treadmill like I did. Andy went on some crazy death run all the way up hill and then back down again. Whatever, Andy. 🙂 After we cleaned up from our respective workouts, we met with Chef Oliver in the lounge area beside Alexander’s. And I have to say, it was one of the most interesting conversations I have had with someone who I don’t really know all that well. It’s kind of an exciting thing interviewing chefs. You never know if you are chatting with someone who might get the next write-up in Bon Appetit, or be awarded a Michelin star. Andy and I chatted with Chef Oliver for about an hour and a half (which went by very quickly) and we both felt William is already doing great things at Alexander’s and has a bright future ahead. The biggest question I had for the chef involved the logistics of running a restaurant that is basically out in the middle of nowhere. How often do you get deliveries? Where do your staff live? How far do they commute? The Chef told me that deliveries come basically every day except for Saturday and some items (such as pork) are actually drop shipped. Some of the staff live in a town close by called Cazadero, some live in Bodega Bay (45 minutes away) and a few of them even commute from Santa Rosa every day (nearly an hour and a half away). I also asked about his career history and background and found out that he is originally from Maryland, and graduated with honors from the Culinary Institute of America. 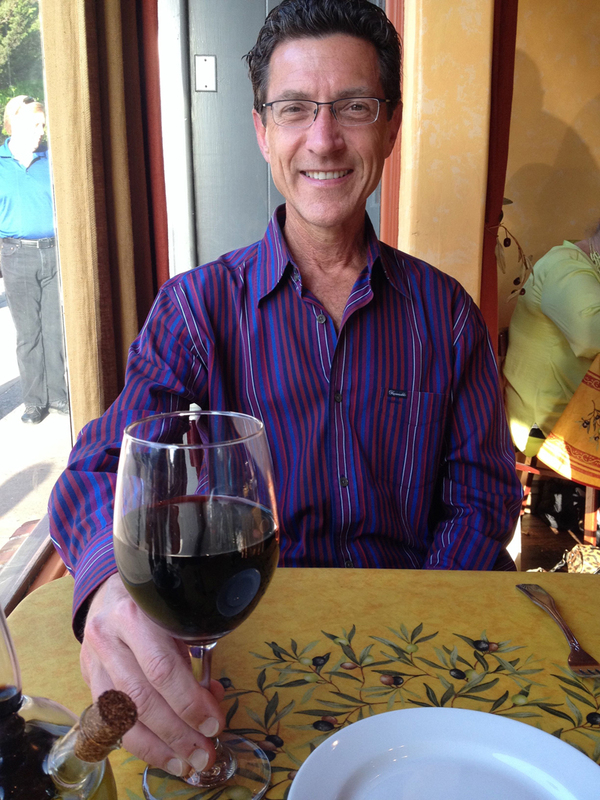 Early on, Chef William realized that wine sales were a big part of a restaurant’s success, and so he went to California to learn as much as he could about the industry. 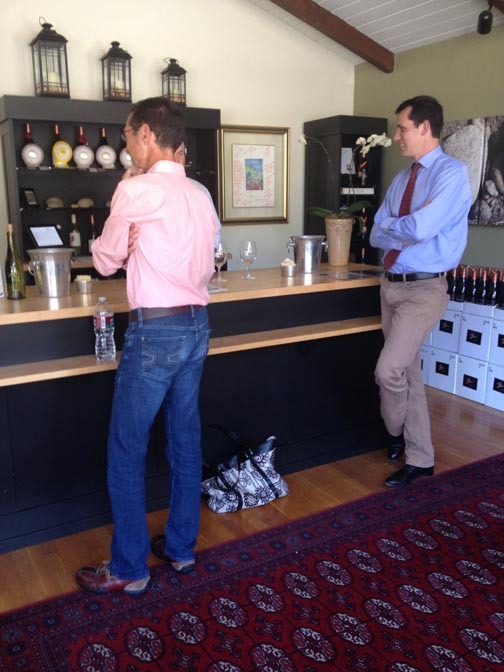 He became a Sous Chef for celebrity Chef Joachim Splichal’s wine country outpost Pinot Blanc. Much like myself and my discovery of California wine and the agriculture present here, I think Chef Oliver realized this was home. 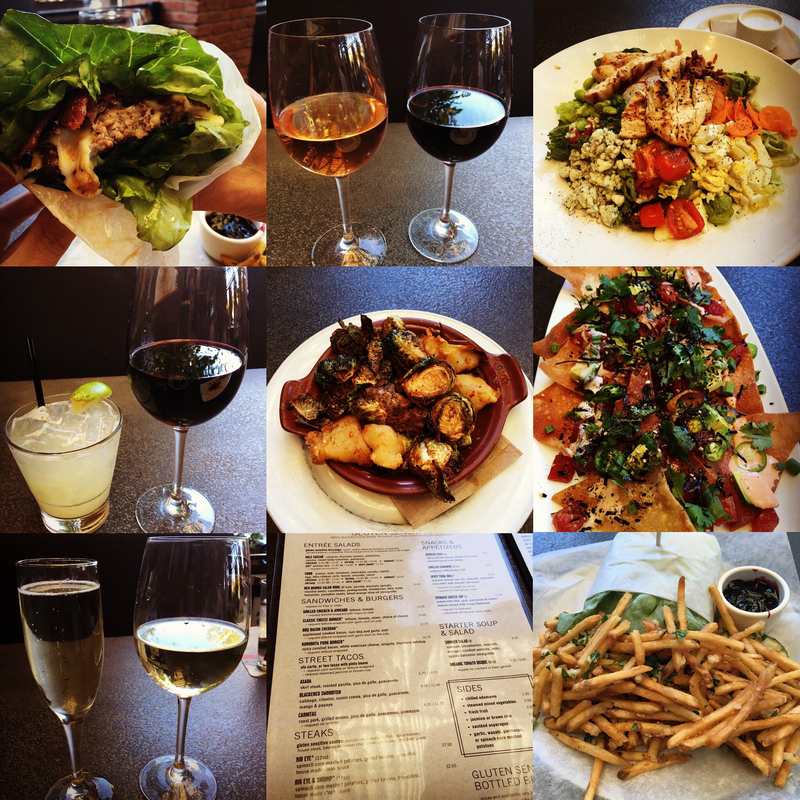 There’s just nothing better than a place where food is made to pair with wine and wine is made to pair with food. 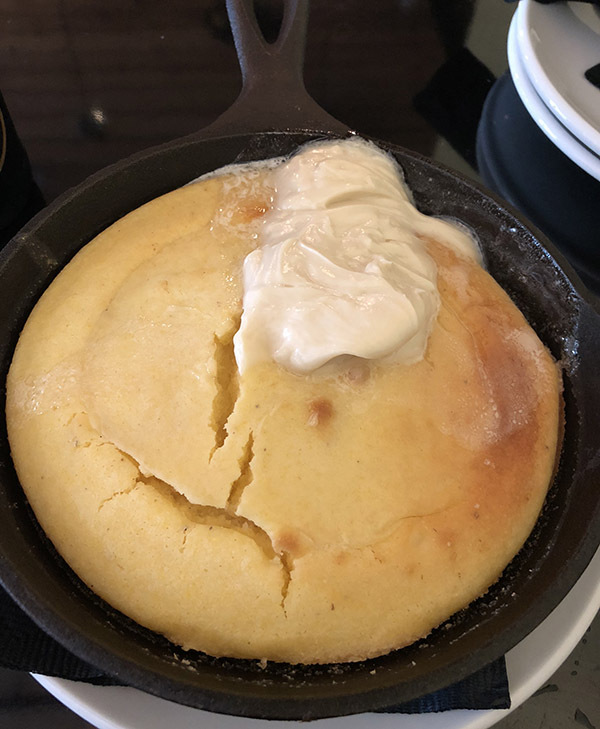 The chef continued to cook for wineries such as Folie a Deaux, Clos Pegase, Mayo Family Winery and Arista, and then went on to Cook St. Helena and Russian River’s Farmhouse Inn. 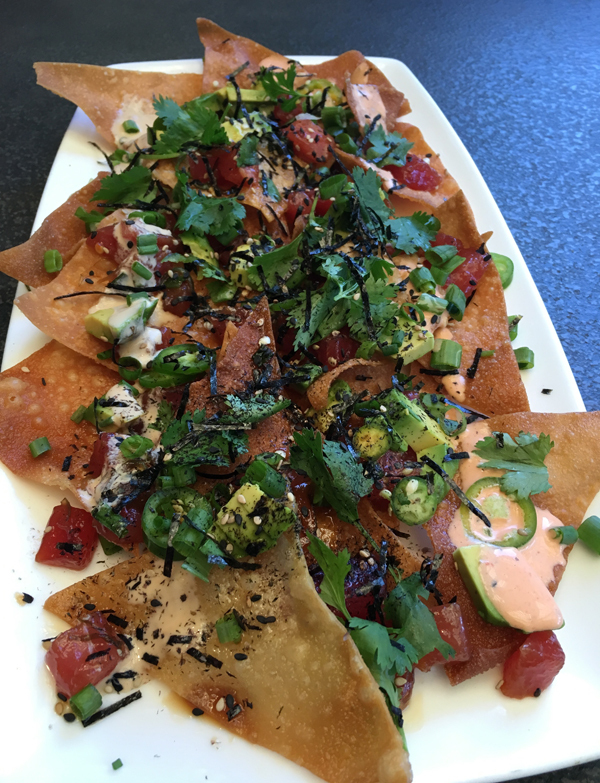 Through the years, Chef William developed relationships with food purveyors that remain in place today and allow him to develop menus that utilize local seafood, cheese and produce that he would not be able to obtain otherwise. 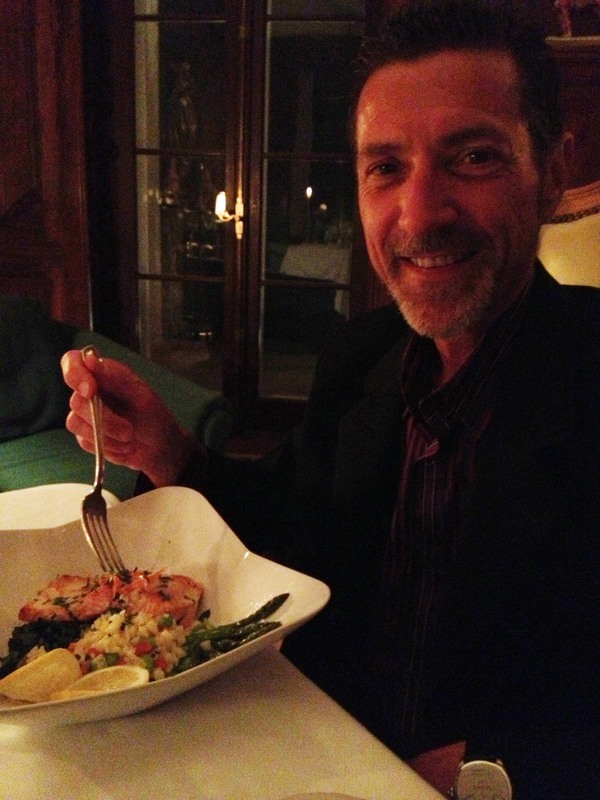 Then the Chef came to Timber Cove Inn. After shaking up the kitchen, dusting off the menu a bit, and putting mostly all local wines on the wine list, things are falling into place. We also talked about the “struggle” of traditional food versus modern. One dessert mentioned was “S’mores”. He tried doing house made graham crackers and marshmallows, and using a much higher quality chocolate, but many people revolted. I’m not sure why. I told him that if I am going to eat junk food, I would prefer it be from scratch junk food. Ah well, don’t worry boring people, Chef William went back to providing pre-packaged ingredients for the S’mores. (There’s a fire pit right outside the restaurant where you can make them). Of course, I was already thinking about dinner, so we talked briefly about how much we enjoyed the previous night’s dinner and how much we were looking forward to this night’s dinner. 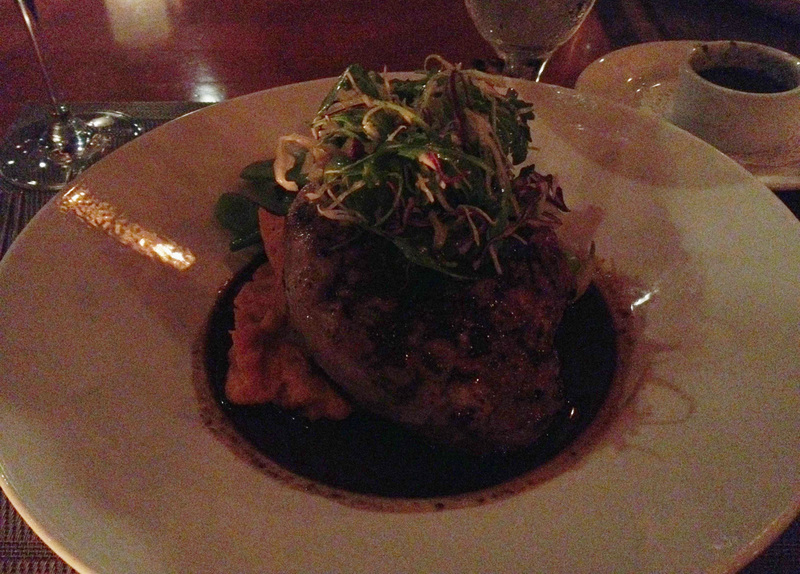 We decided in advance on the steak and Chef William spoke a little bit about the dish. The meat is grass-fed and the Worcestershire sauce is house made. We also inquired about the size of the plate because we planned on splitting it (he confirmed the meat serving is about a pound and it is the biggest plate on the menu). I want to thank Chef William for taking time (out of what would become a very busy Saturday), to chat with us. After our conversation with the Chef, we went over to the restaurant and had a little breakfast (even though after all the steak talk I was ready for dinner!) 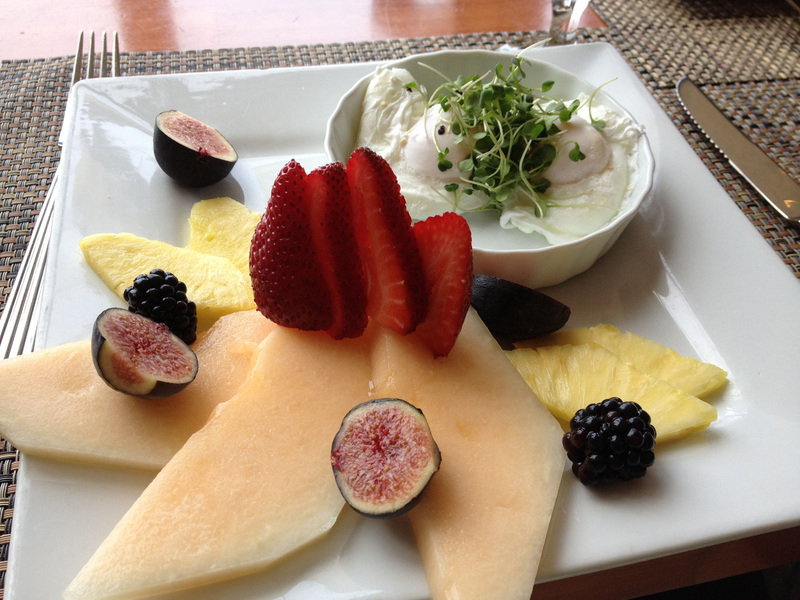 Andy and I ordered the same thing: 2 poached eggs with fruit and potatoes (served with salsa). Following breakfast, Andy and I went on a walk around the property at Timber Cove Inn. 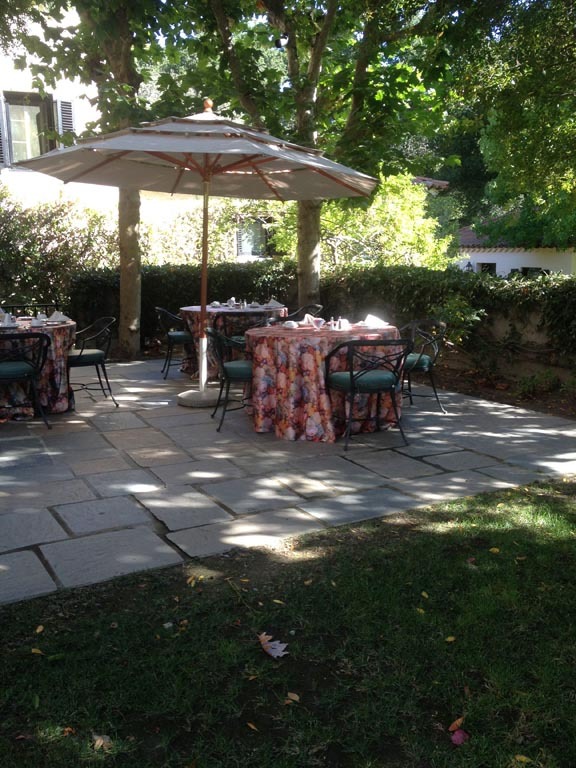 The Inn originally opened in 1963, and was redesigned and reopened in 2008 ($2.5 million renovation). 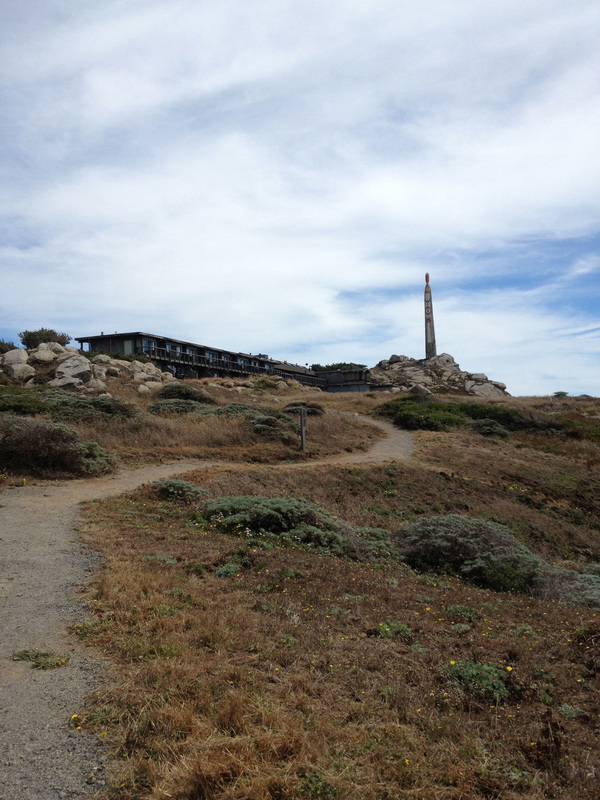 It is built on 25 acres, and there are two miles of hiking trails for guests of the hotel to use. I will say “hiking” because I they really are not run-able, but great for walking and taking in the ocean view. And that’s what we did for an hour and a half. 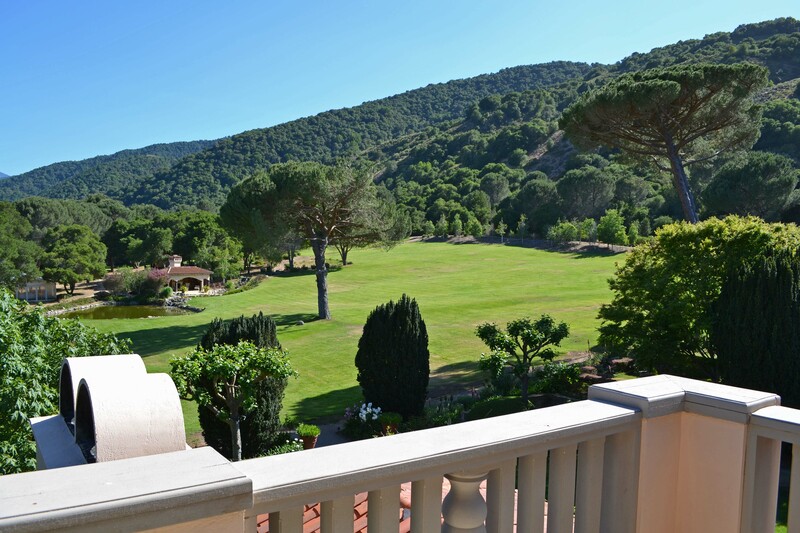 Roam around the property and take in the views. 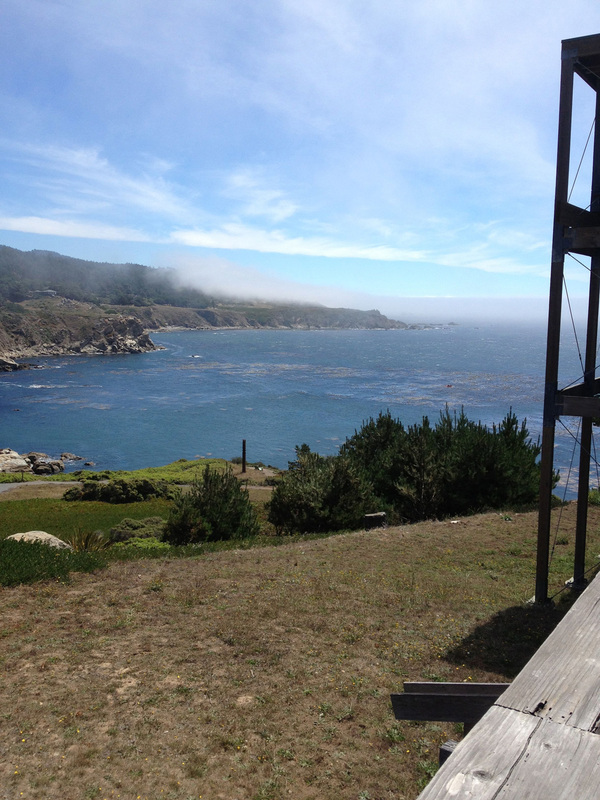 There are benches around the grounds at Timber Cove where you can sit and face the ocean and just stare out at it. It was great to do just that and enjoy our time together. Timber Cove Inn has 47 guest rooms and 2 suites. All rooms offer views of ocean, cove or forest. The Inn was designed by a protégé of Frank Lloyd Wright, and the Timber Cove Inn reflects his style, evident especially in Alexander’s bar area in the frames around the lighting fixtures. 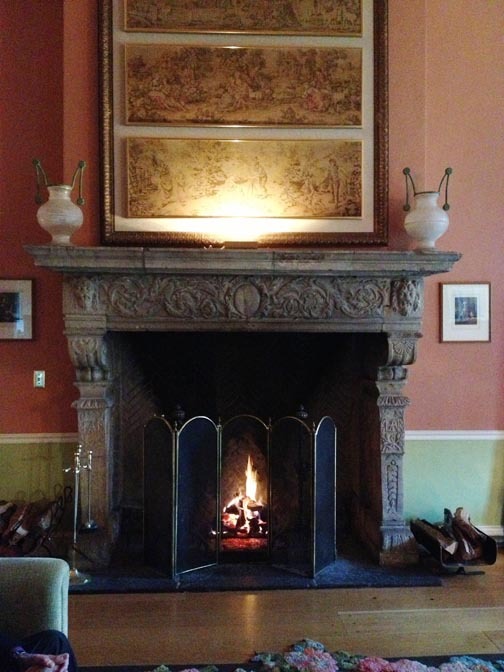 A three-story stone fireplace dominates the lobby and the structure that houses the lounge, Alexander’s, the gift shop and the main lobby is much like a large lodge. The Pacific Ocean outside only 50 yards away. 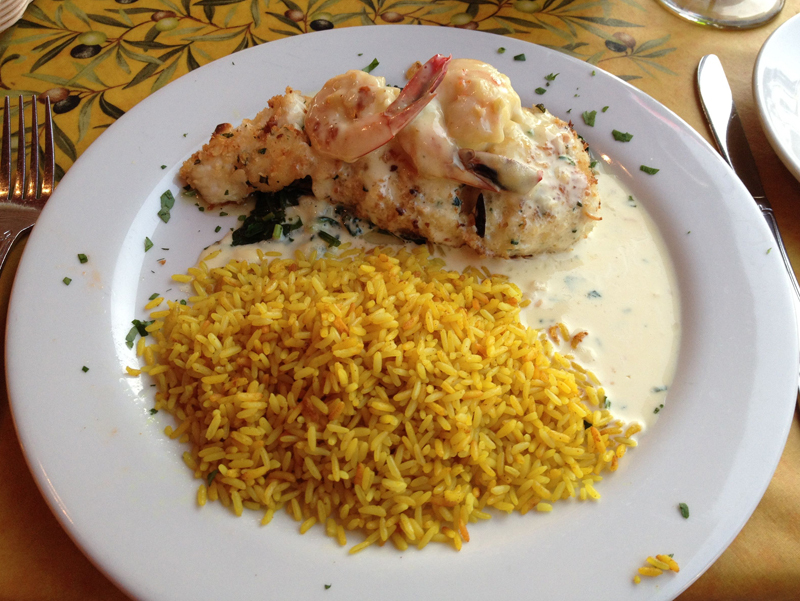 Soon, it was time to head back to Alexander’s for dinner. We sat by the fire again, and soon greeted by our server Stacy (from the previous evening). I spotted a gazpacho on the pre fixe menu that I really wanted to try, and asked if it was possible for me to sample it without getting the entire menu. Of course, I never heard the word “no” one time on this getaway, so soon out it came, and even a serving for Andy, too. There were chunks of crab in it, and I think I would have been happy with a large bowl of it and a big glass of pinot noir from the previous night. But, no! We had more work to do. More food to taste and explore. 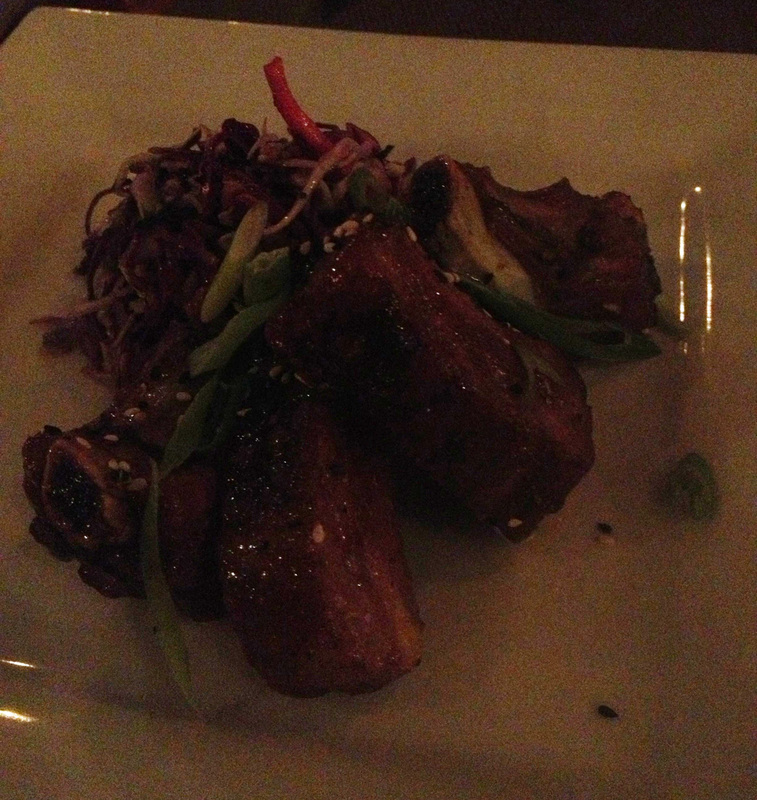 And so we decided on the 5-Spice Pork Ribs with a Sweet Chili Glaze and Asian Cole Slaw. I remember really loving everything and for one, eating more than Andy. 😉 That evening, I began to consider moving into the Timber Cove so I would have this kind of food every night. Maybe Chef William would let me work a few shifts in the kitchen now and then? 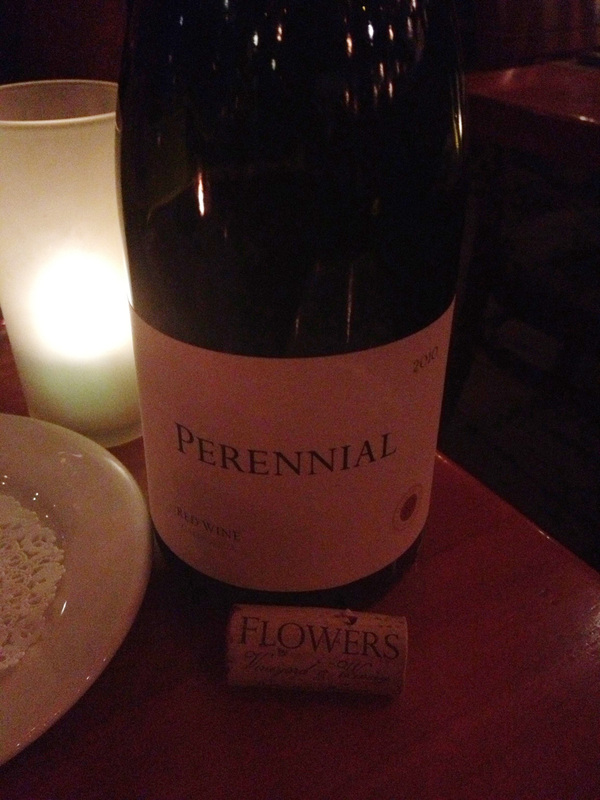 The wine we chose was a Meritage by Flowers Vineyard and Winery called Perennial. Again, a local wine to drink with local food. Then our entrée, the aforementioned steak, was presented. A Grilled Delmonico Steak with Brown Butter Mushrooms and served with Horseradish Mashed Potatoes and House-made Worcestershire sauce. Topped with Onion Rings. 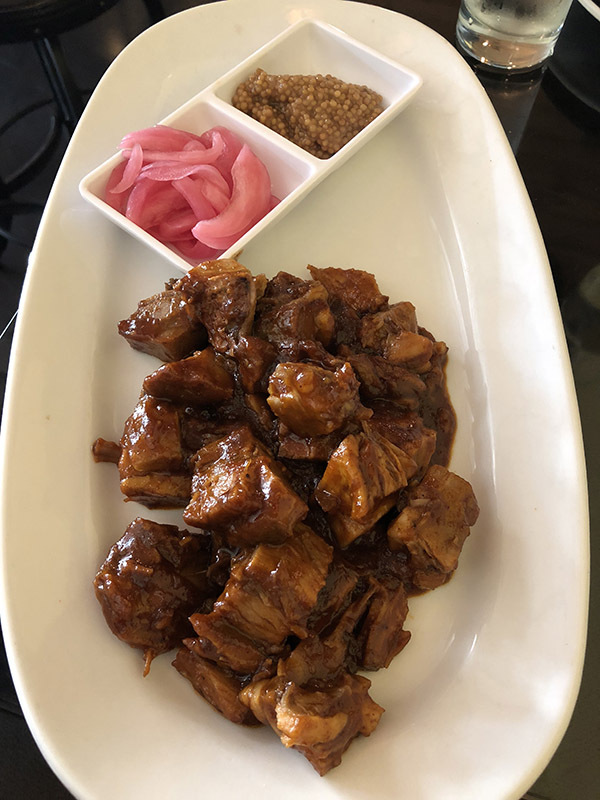 Of course, the onions and the sauce are not Paleo, but I really didn’t want to be a pain to ask to leave them both off, because I had been enjoying the chef’s food so much exactly the way he intended a normal guest to taste it, I didn’t want to start messing things up now. 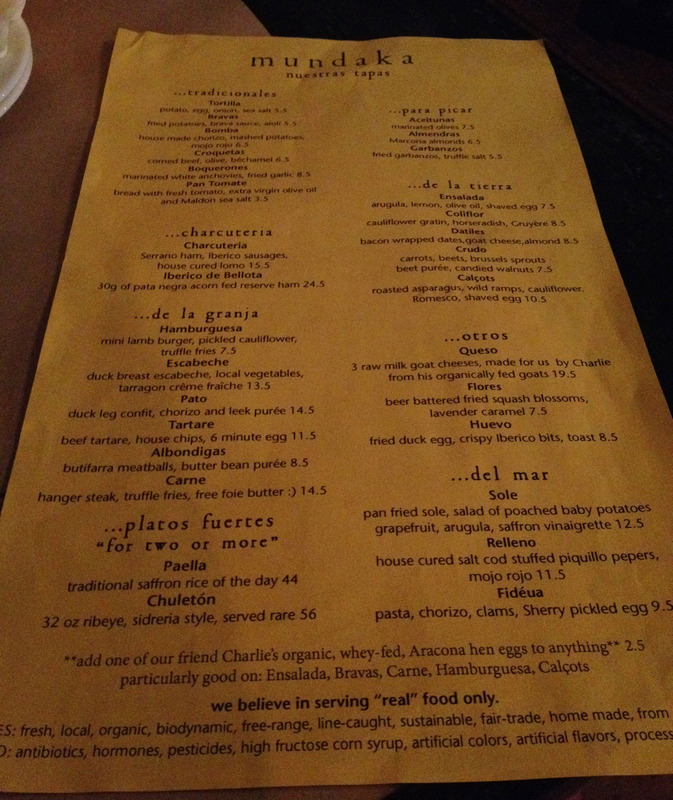 Besides, if you stay away from the bread basket (but do ask for the chimichurri (YES!!) that comes with it!) 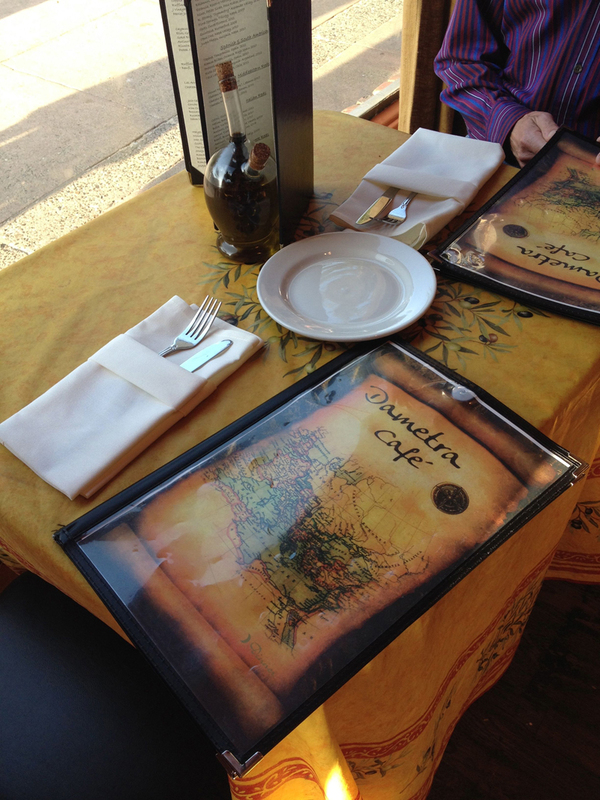 at Alexander’s, the menu is pretty close to Paleo/Primal anyway with a few exceptions. The next morning, I worked out in the gym again and Andy went off to do his death run before we both got cleaned up and again snagged breakfast before checking out. I had exactly the same thing I did the morning before because I’m telling you, the dill potatoes are addictive. 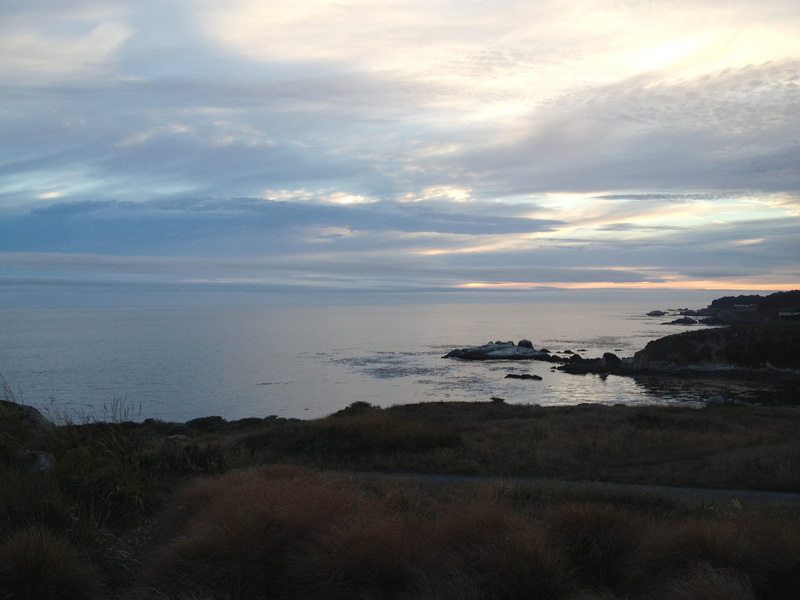 Even though I am so happy to get back to work on Mondays, I was so sad to leave such a beautiful, calm, serene place. I am looking forward to returning to Timber Cove Inn, especially to see the progress of Alexander’s with Chef William Oliver at the helm. You can find Timber Cove Inn on Facebook here and follow them on twitter here. Read more about the Timber Cove Inn over at my friend Virginia’s website, The Perfect Spot, here. What is the concept of Capital Dime? 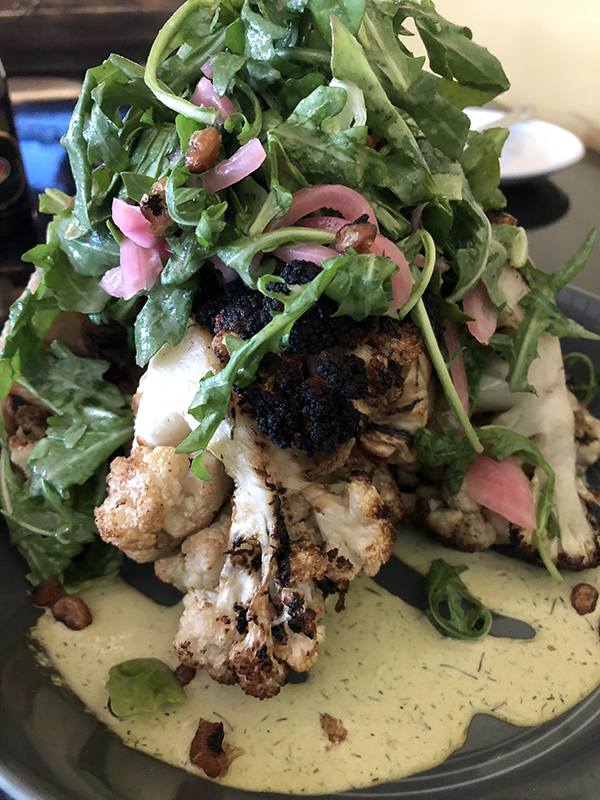 According to the Chef, the restaurant’s goal is to make the farm-to-fork movement accessible to affordable for almost everyone. 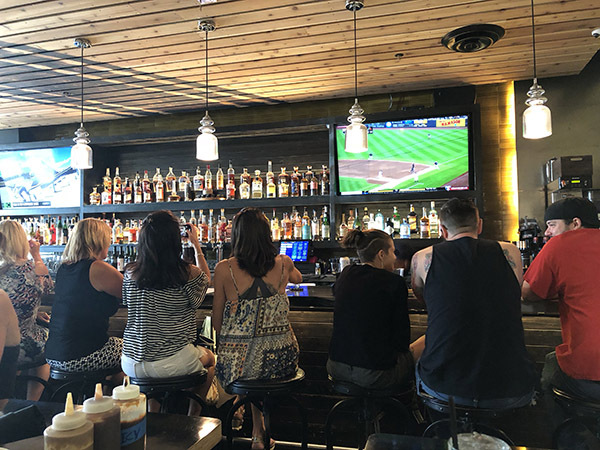 Most of the the plates will be priced around $10, in a setting that can be formal, but not snobby (there are booths in the downstairs along with a few flatscreen TVs). And their logo is pretty neat, too. To start, Andy and I enjoyed a cocktail named “Boxers and Bobbysocks,” created by head bartender Rene Dominguez (who has worked at Ella Dining Room and Bar), containing gin, bitters, muddled cherries and rosemary. Some of the bites we tasted were (shown above in the slideshow) an artichoke dip on a crostini paired with pulled pork in a mini tostada. The next course was a spicy shrimp and watermelon salad featuring a few Asian ingredients: bonito flakes, fish sauce juxtaposed with fresh mozzarella and squash blossoms arranged beautifully on a tea leaf. 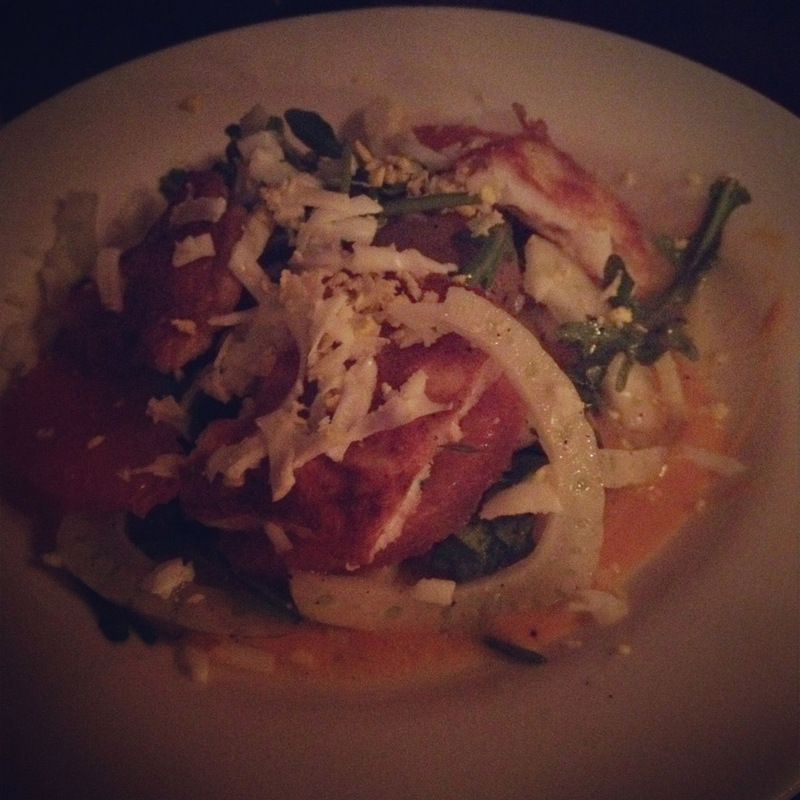 I liked the salad more and more with each bite as it took me a minute to wrap my brain around the combining flavors. I like just about anything with watermelon in it this time of year. The next sampler was a slider of pastrami (cured and smoked in house) paired with shoestring fries. The fries were topped with what appeared to be gravy, bacon and cheese. Look ma, no calories!! 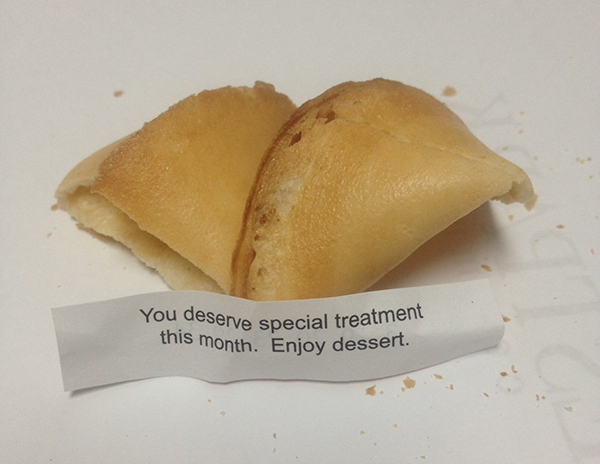 The dessert was a soft chocolate-chip cookie. I try to stay away from these types of things, happy with the natural sugar level in my drink, so Andy happily snarfed had four of them. Andy, thanks for taking one for the team, I know it’s hard work. The chef says there will not be a dessert menu and doesn’t currently have a pastry chef. 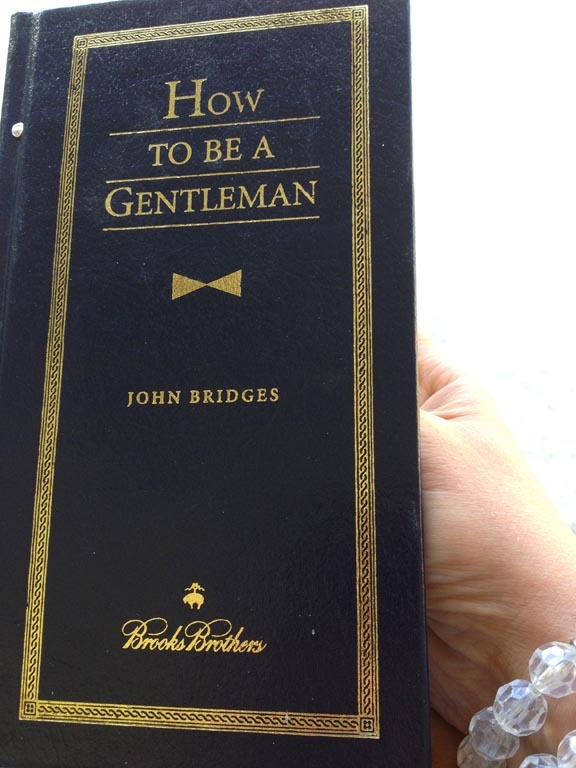 Noah, this is my formal application. LOL. Pick me! I’d serve my gluten-free s’more pie from the party and I put on at Caverna 57 on Saturday. 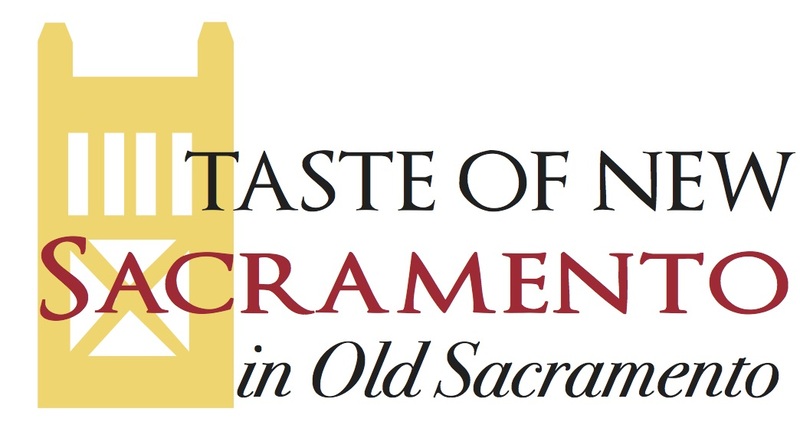 Capital Dime will be participating in Sacramento’s Bastille Day Celebration on July 14th. They will have a booth with free appetizers from 11:30 am to 3 pm.